© 2002, © 2018 by Paul Freeman. Revised 7/15/18. 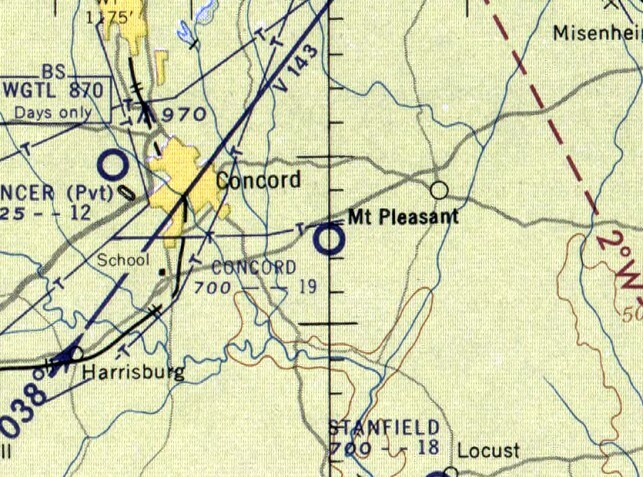 The original Concord Airport, as depicted on the October 1940 Charlotte Sectional Chart. 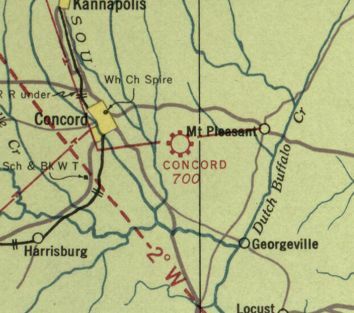 The original airport for the town of Concord was located southeast of the town. as it was not yet depicted on the August 1937 Charlotte Sectional Chart. was on the October 1940 Charlotte Sectional Chart, which depicted Concord as a commercial/municipal airport. was a circa 1943-45 aerial view looking north from the 1945 AAF Airfield Directory (courtesy of Scott Murdock). It depicted Concord Aiport as having 2 (or 3) unpaved runways, with a small building on the east side. as a 100 acre cross-shaped property having 2 clay runways, measuring 1,920' northwest/southeast & 1,800' northeast/southwest. The field was said to have 3 hangars, the largest being a 80' x 44' wood & metal structure. Concord Airport was described as being owned & operated by private interests. 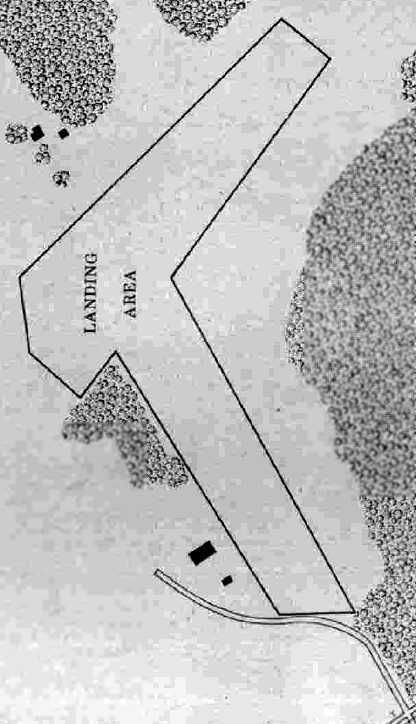 The original Concord Airport, as depicted on the 1954 USGS topo map. According to Clark Howard, “The old Concord Airport had 2 dirt runways, along with 2 hangars, which housed several light aircraft. One of these buildings hosted the Civil Air Patrol for some years. It was located several miles southeast of town. The airport was used on weekends for airplane rides, skydiving, and model airplane meets. I was treated to my first airplane ride there in 1954, in a Piper Super Cruiser. During the 1950s, there were several BT-13 aircraft parked derelict along with a large Stinson V77. 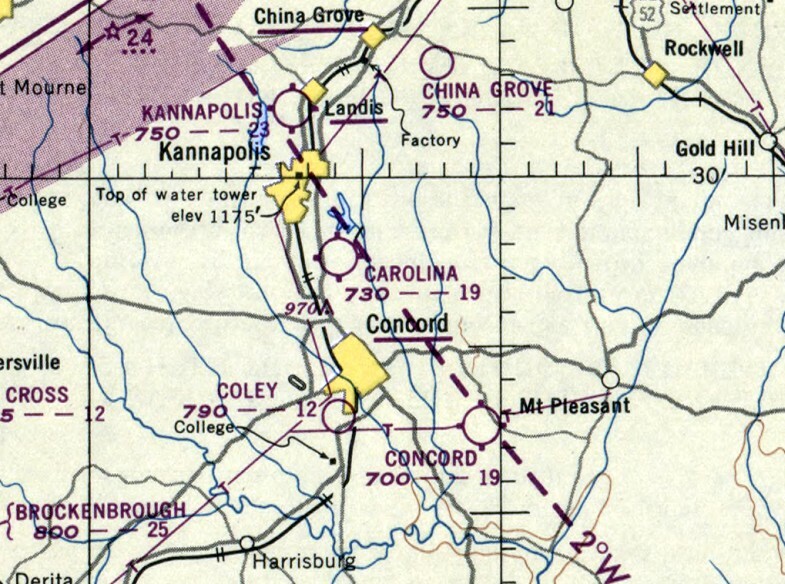 The last aeronautical chart depiction which has been located of Concord Airport was on the January 1957 Charlotte Sectional Chart. It depicted Concord Airport as having a 1,900' unpaved runway. The 1957 USGS topo map depicted Concord Airport as having 2 perpendicular unpaved runways, with 2 small buildings on the northeast side. as it was no longer depicted on the July 1960 Charlotte Sectional Chart. but there were no aircraft visible on the field nor any other indication of recent aviation use. 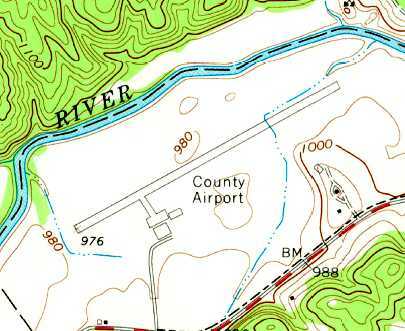 The 1974 USGS topo map depicted the original Concord Airport in the same fashion as the 1957 topo map. 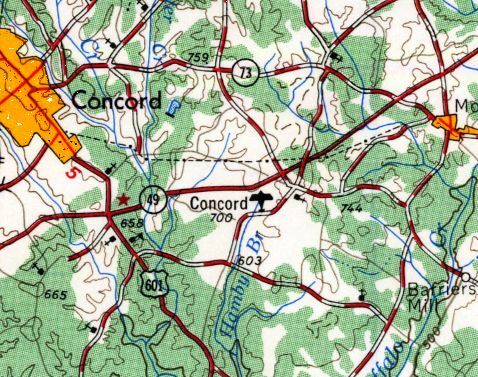 The 1980 USGS topo map depicted an empty area in place of the original Concord Airport. A 2015 aerial view looking north showed no trace of the original Concord Airport. Boyington Court & Navion Place. Thanks to Clark Howard for pointing out this airfield. 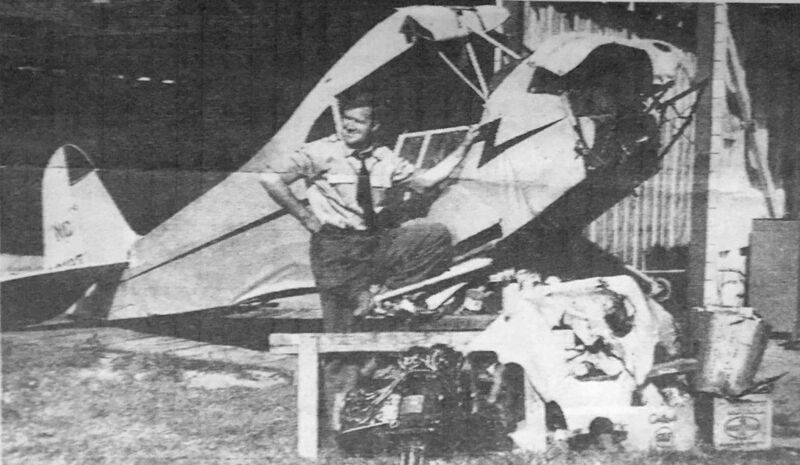 A circa 1942-43 photo of Haskell Deaton of the Plaza Airport in front of a Piper Cub has we donating to a Civil Air Patrol scrap metal campaign (courtesy of David Stevenson). According to Eric Karnes, “Plaza Airport... was operated by Johnny Crowell, a pioneer NC aviator. nor the February 1942 Charlotte Sectional Chart. was a circa 1942-43 photo of Haskell Deaton of the Plaza Airport in front of a Piper Cub has we donating to a Civil Air Patrol scrap metal campaign (courtesy of David Stevenson). It depicted Plaza Airport as having 2 unpaved runways, with a row of hangars on the south side. 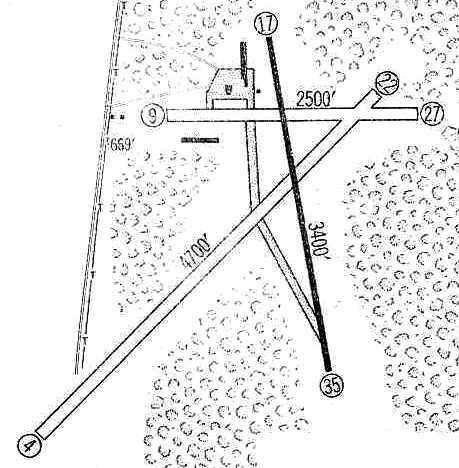 as a 28 acre cross-shaped property having clay runways, measuring 2,000' north-northeast/south-southwest & 1,400' west-northwest/east-southeast (“badly eroded”). and was described as being owned & operated by private interests. was on the April 1944 Chattanooga Sectional Chart (courtesy of David Stevenson). The 1945 Charlotte Sectional Chart (courtesy of John Voss) depicted Plaza as a municipal/commercial airport. An undated (circa 1940s?) photo of several Piper Cubs in front of & inside the row of 6 individual hangars at the south end of Plaza Airport (courtesy of George Mihal of the Office of Image Archeology). Dave recalled, “The Thrasher Brothers featured their Twin Encoupe. The 1948 USGS topo map depicted Plaza Airport as having a single unpaved northeast/southwest runway, with 7 hangars on the southeast side. 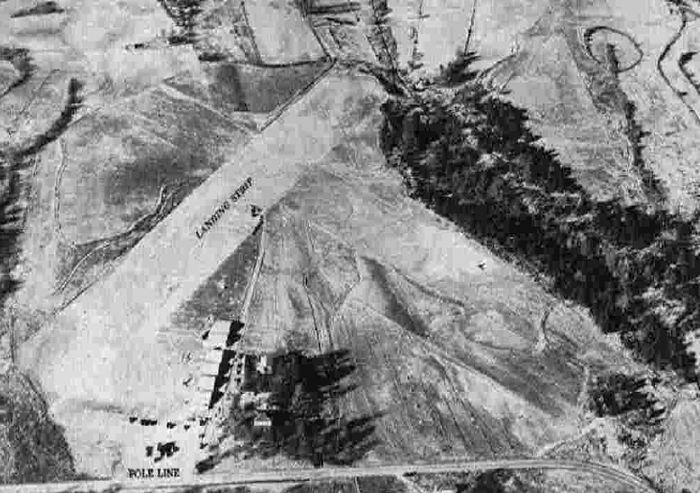 The last photo which has been located of Plaza Airport was a 5/14/48 USGS aerial view. and a row of hangars on the south side. The last aeronautical chart depiction which has been located of Plaza Airport was on the April 1952 Charlotte Sectional Chart. It depicted Plaza as having a 2,000' unpaved runway. as it was no longer depicted on the February 1955 Charlotte Sectional Chart. A 1960 aerial photo showed new homes & streets covering the site, with no trace remaining of Plaza Airport. A 2014 aerial view showed a residential neighborhood covering the site of Plaza Airport, with no recognizable trace remaining of the former airport. The site of Plaza Airport is located north of the intersection of The Plaza & Vickery Drive. Thanks to Eric Karnes for pointing out this airfield. 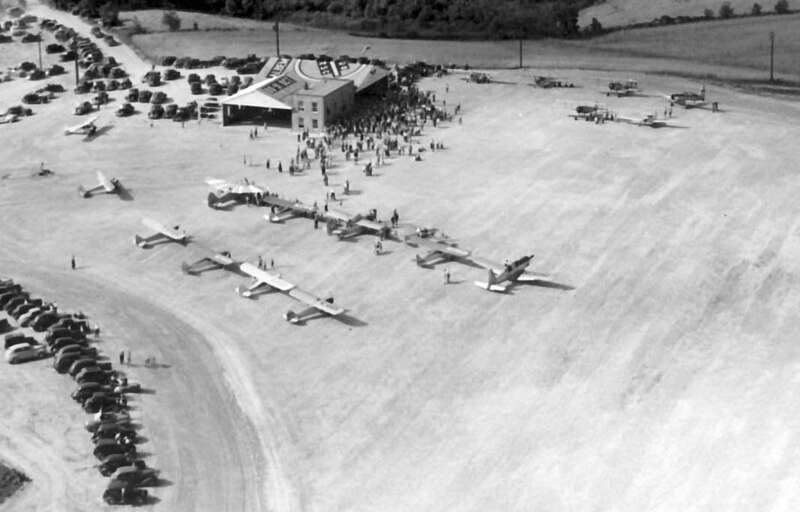 A 6/4/47 aerial view of the grand opening of the Albemarle Airport (from the Stanley County Museum, courtesy of Louis Bramlett). as described in an article entitled “Large Crowds Witness Thrilling Aerial Show” in the 6/6/47 Stanly News & Press (from the Stanley County Museum, courtesy of Louis Bramlett). marking the official opening of the new Albemarle Airport southeast of the city. kept the crowds thrilled and entertained from 1 o’clock until evening. who was piloted on her first air trip by a crippled pilot John Brines of near Albemarle. The article continued, “The crowd loudly applauded Mrs. Andrews, who was introduced over the loudspeaker by Haskell Deaton, owner of the Plaza airport in Charlotte. Mr. Deaton & Alonzo Squires, popular radio announcer of station WAYS of Charlotte, served as masters of ceremonies throughout the afternoon. Many pilots were on hand to fly the 27 planes participating in the colorful air show. and other representatives from practically all airports in the state. Mr. Brockenbrough thrilled the crowd by flying his plane 3 times under electric wires running along the edge of the field. opened his professional jumping career with a jump from the Stearman piloted by Hazel Smith, one of the 4 owners of the field. From an altitude of 3,000' Poplin floated to earth. By a miscalculation of windage, the parachutist landed unhurt in a field several hundred yards outside the bounds of the airport. The article continued, “It was announced at the show that flying training would be started at the field in the near future. has been approved as a training center for veterans wanting to take flying lessons under the provisions of the GI educational bill. In addition to offering flying training, the owners have 5 planes for charter trips & short rides. 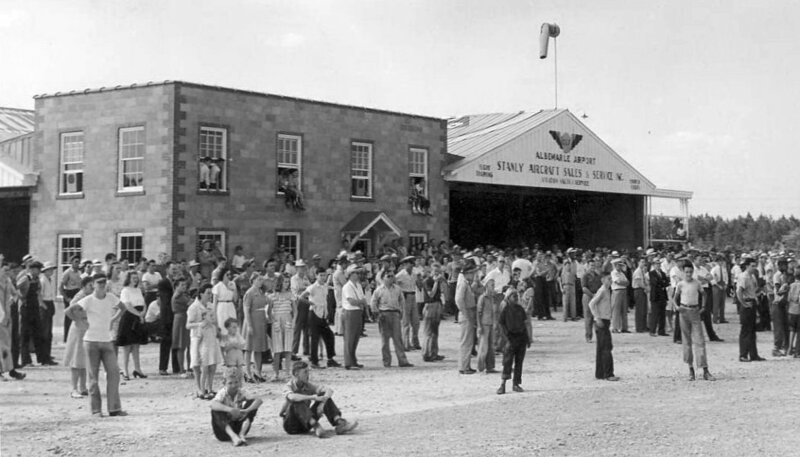 A 6/4/47 photo of the crowds viewing the grand opening of the Albemarle Airport (from the Stanley County Museum, courtesy of Louis Bramlett). which depicted Albemarle as a commercial/municipal airport. 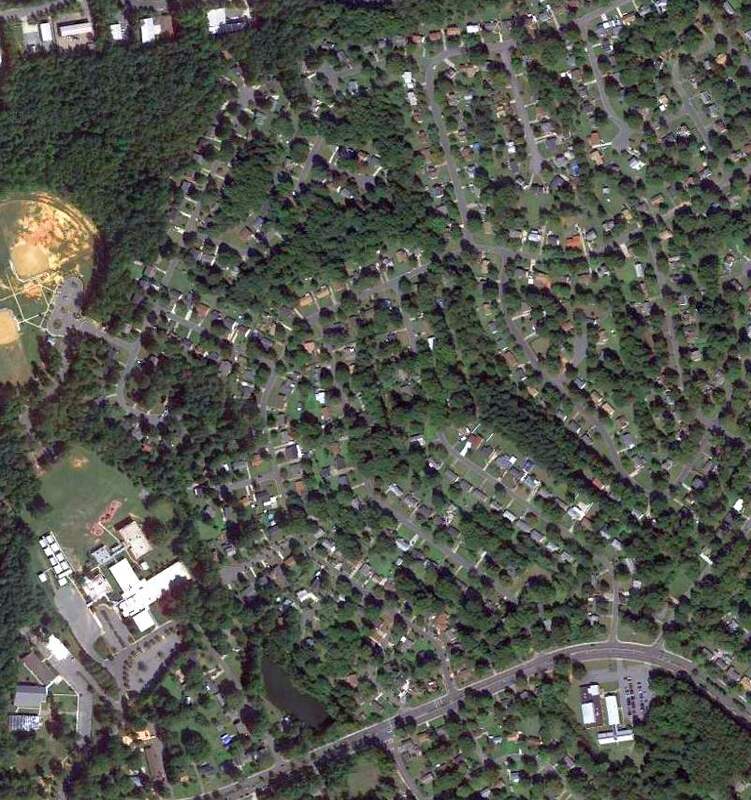 which depicted Albemarle as having a single northeast/southwest runway. as having a unpaved 3,175' Runway 3/21, with a building at the north end. which depicted Albemarle as having a 3,200' unpaved runway. 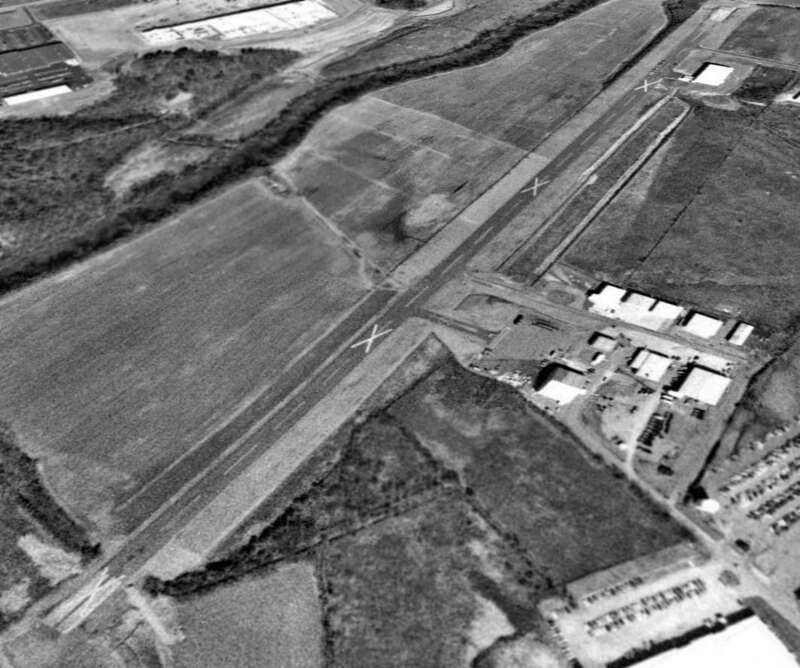 The last photo to be located showing Albemarle Airport in operation was a 1977 USGS aerial photo. 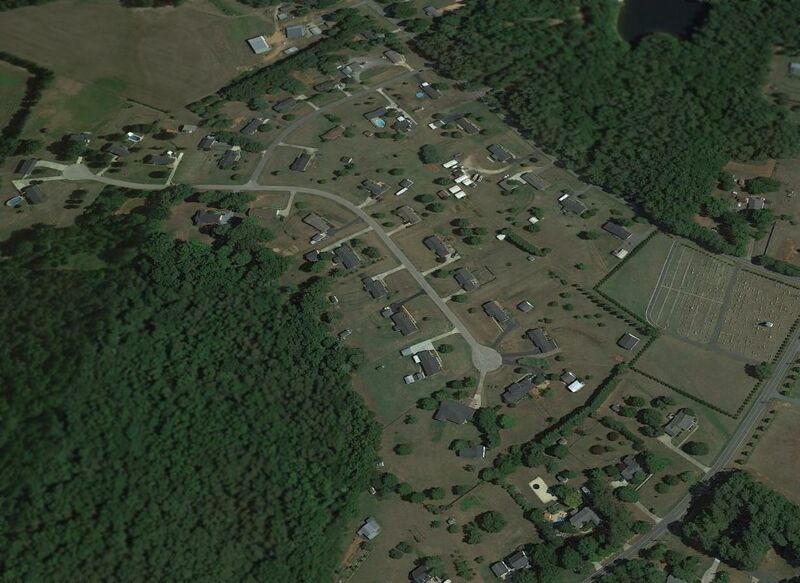 It depicted Albemarle as having a single northeast/southwest runway, with a few small buildings on the north side. The larger Stanley County Airport opened in 1979 to the northeast of Albemarle, at which point Albemarle Airport presumably was closed. 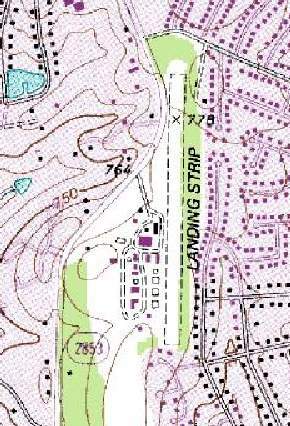 The 1982 USGS topo map still depicted the runway & one small building, but labeled as “Abandoned Airport”. but several airport buildings & most of the runway remained intact. 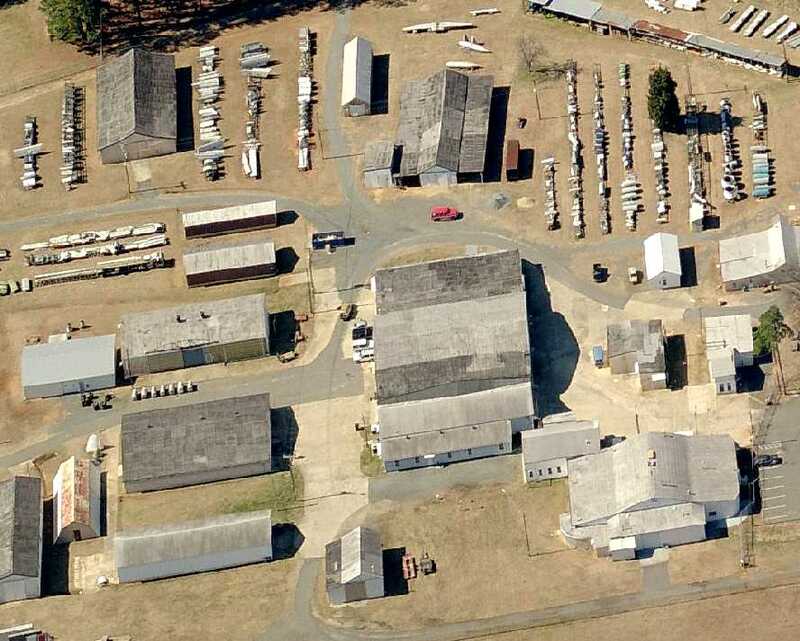 A 1998 aerial photo showed that the Albemarle Airport buildings remained standing. 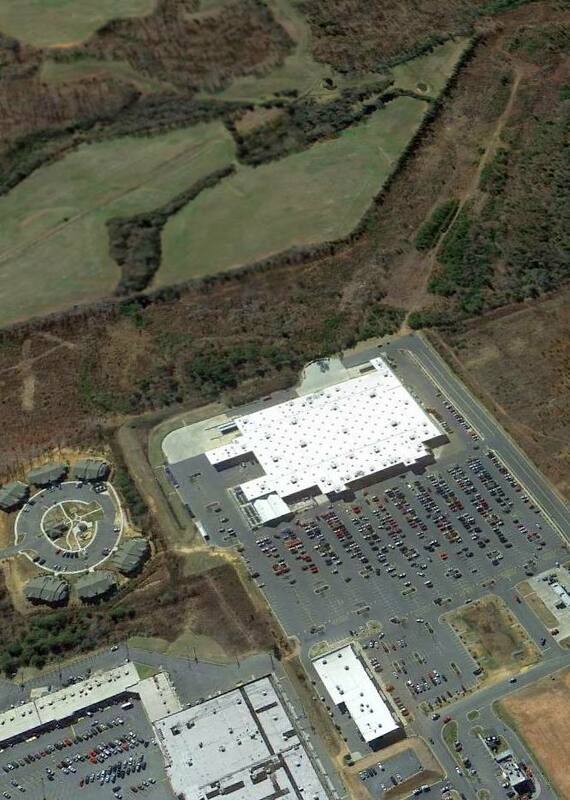 A 2005 aerial photo showed that a larger building (a Wal Mart) had covered the site of the Albemarle Airport buildings. but the former runway remains recognizable extending away toward the southwest. 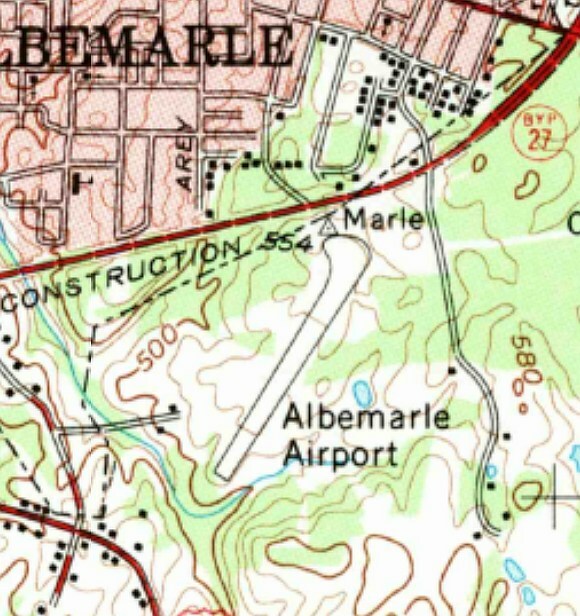 The site of Albemarle Airport is located south of the intersection of route 73 & Leonard Avenue. Thanks to Michael Price for pointing out this airfield. 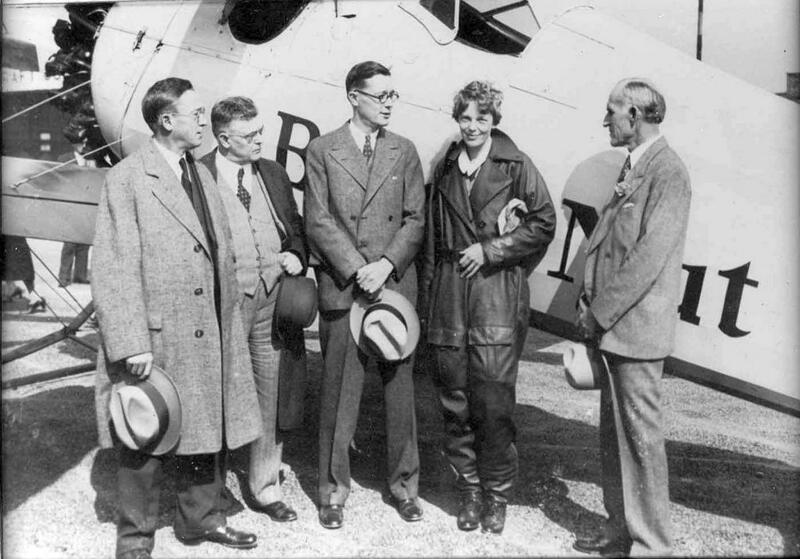 A 1931 photo of Amelia Earhart visiting Charlotte (presumably at Cannon Airport) as part of a promotional tour sponsored by Beech Nut chewing gum. To her right is Chamber of Commerce President Clarence Kuester. “Prior to the building of Douglas Airport, flights in & out of Charlotte were rare. a small private venture operated by Johnny Crowell, a famed Charlotte aviator. as part of a promotional tour sponsored by Beech Nut chewing gum. as having 4 runways & 2 hangars on the north side. 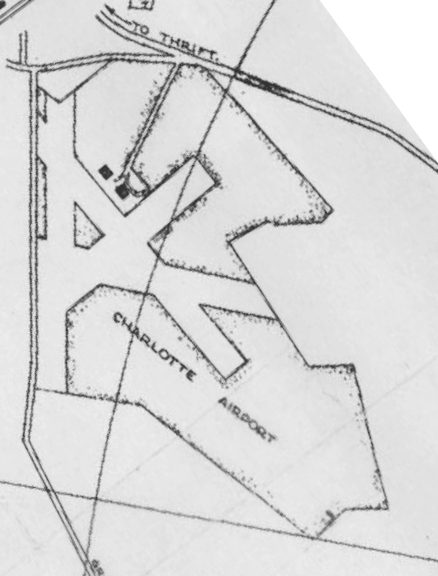 The original Charlotte Airport, as depicted on the May 1935 Charlotte Sectional Chart. 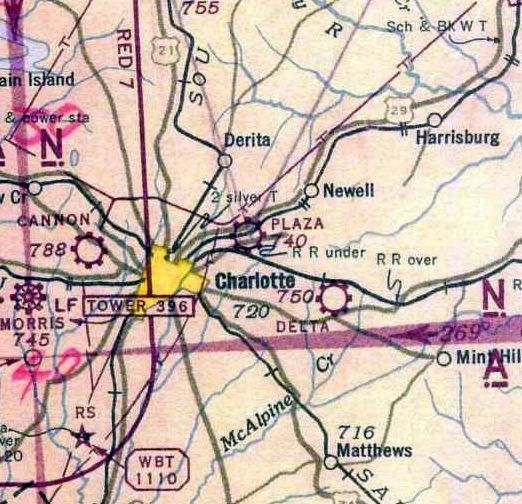 as that is how it was labeled on the Chamber of Commerce's 1942 “Official Map of Charlotte”. 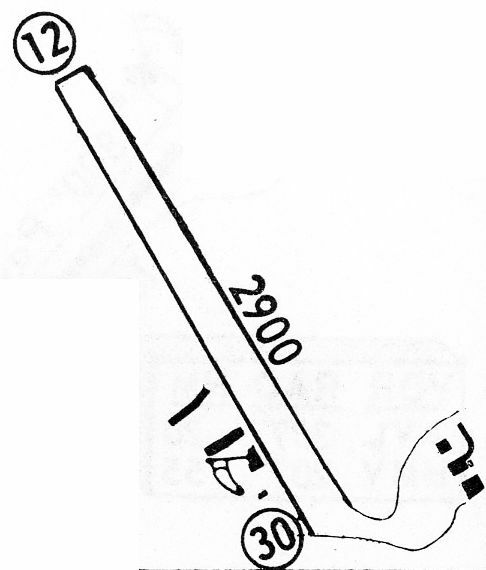 The airfield configuration remained unchanged compared to the 1935 map. and remember going there on my bike to look at a T-6 that a couple of drunks crashed after a night of partying! 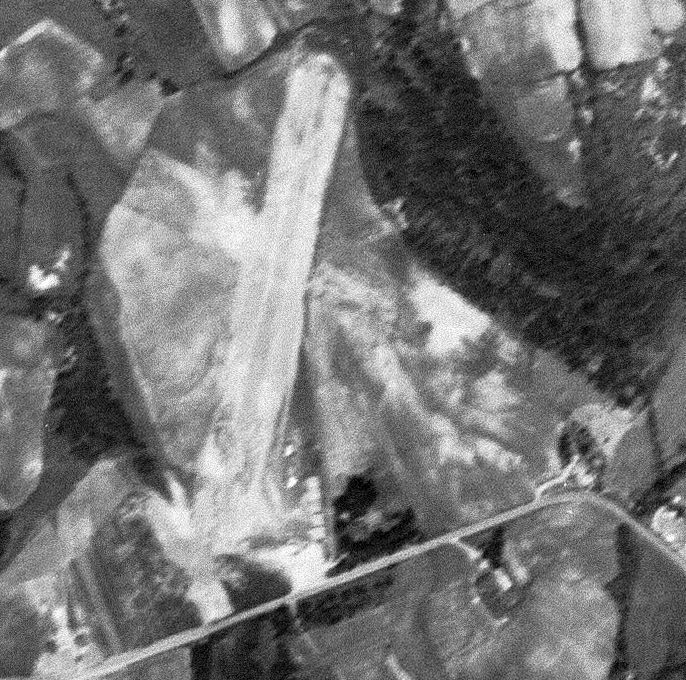 The last photo which has been located of Cannon Airport was a 5/15/48 USGS aerial view. but no aircraft were visible on the field. The 1949 USGS topo map depicted Cannon Airport as having 3 runways & 4 hangars. 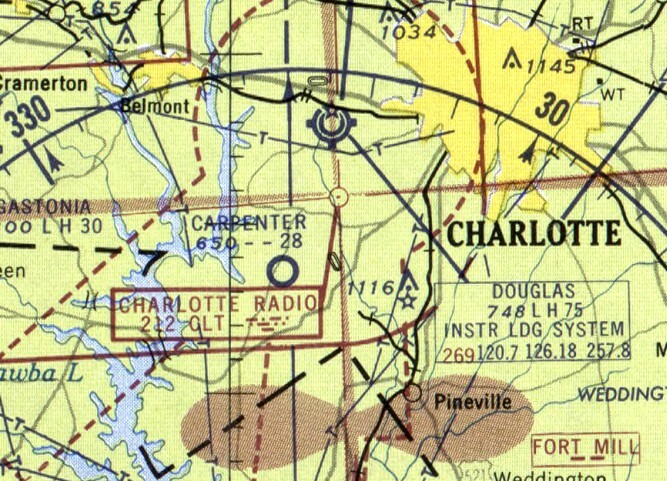 The last aeronautical chart depiction which has been located of Cannon Airport was on the January 1955 Charlotte Sectional Chart. It depicted Cannon as having a 2,300' unpaved runway. as it was no longer depicted on the January 1957 Charlotte Sectional Chart. A 1960 USGS aerial photo depicted a large number of trailers being stored in front of the Cannon Airport hangars. 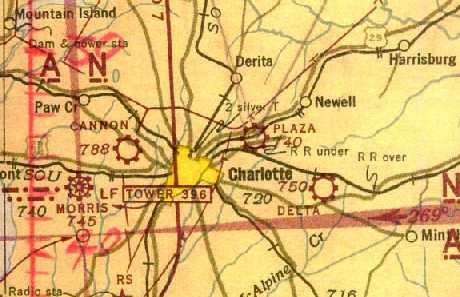 Cannon Airport was no longer depicted on the 1962 Charlotte Sectional Chart. 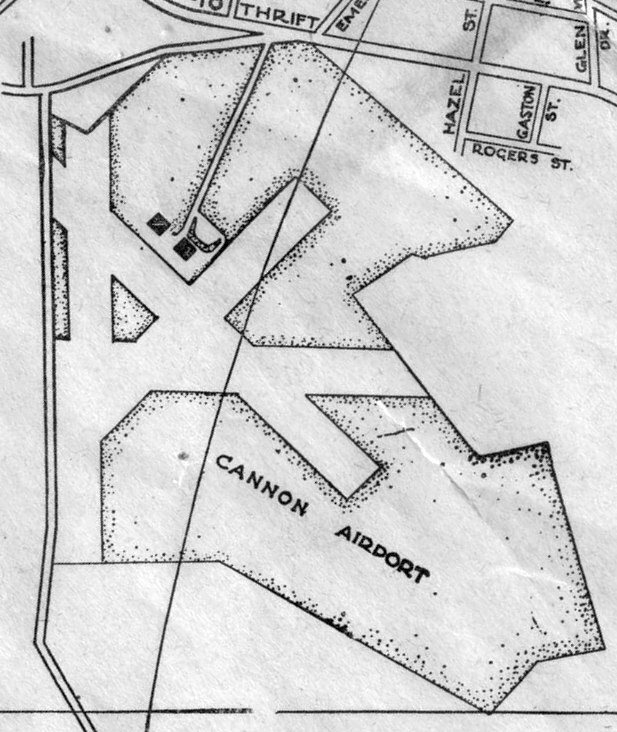 The 1965 USGS topo map continued to depict Cannon Airport in an unchanged fashion. 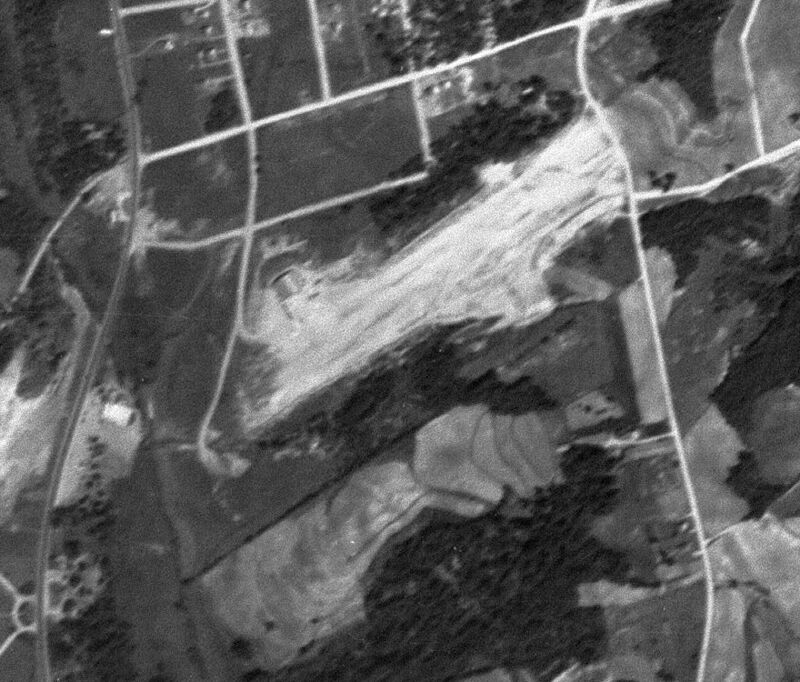 A 1968 USGS aerial photo continued to show Cannon Airport as remaining intact, though deteriorated. still depicted the 4 hangars, and a survey marker named Cannon. A 1971 aerial photo showed that a drive-in movie theater had been built over the eastern portion of the Cannon Airport site. But the 4 hangars remained standing. 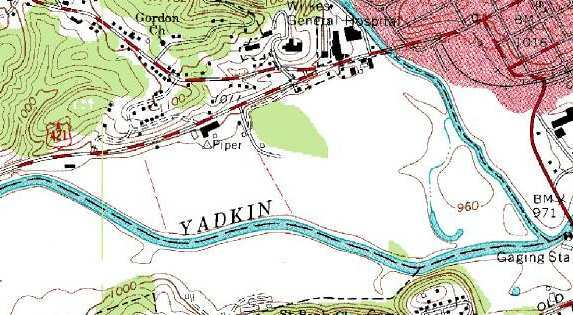 The 1978 USGS topo map continued to depict the site of Cannon Airport in an unchanged fashion. covering the site of the hangars & removing the last traces of the airport. According to Eric Karnes, “Freedom Mall was one of the first malls in Charlotte. The 1996 USGS topo map continued to depict a survey marker named Cannon. 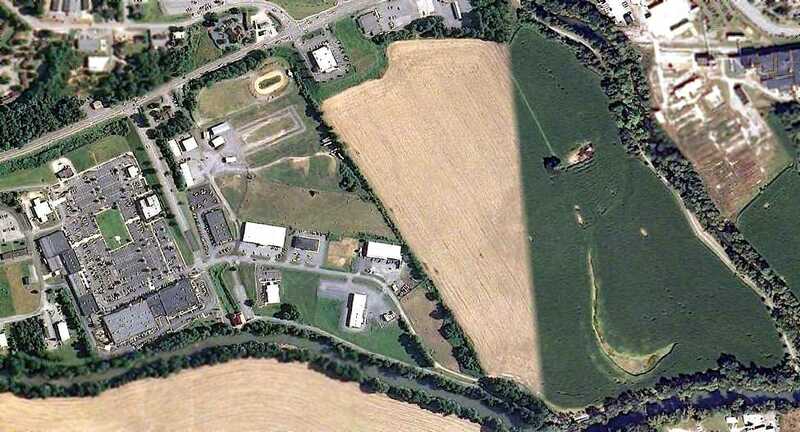 An 8/24/12 aerial view showed no trace remaining of Cannon Airport. The site of Cannon Airport is located east of the intersection of Ashley Road & Lindbergh Street, appropriately enough. 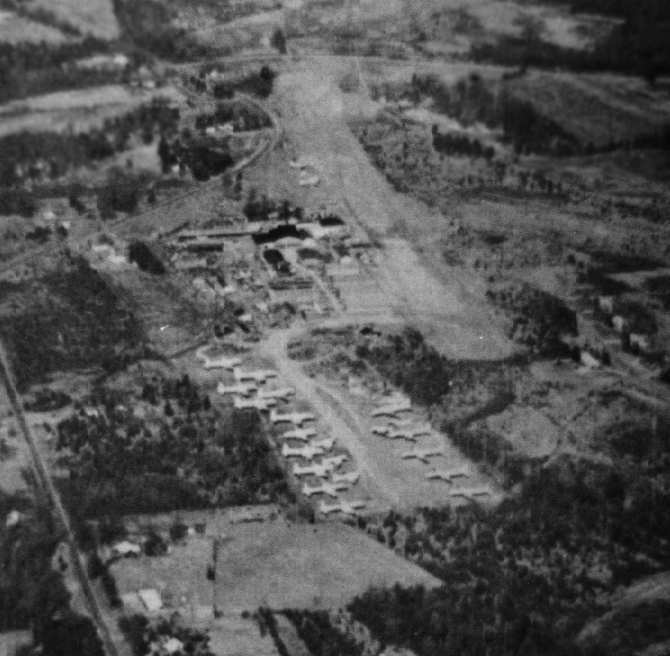 A 5/15/48 USGS aerial view of Carolina Air Park. This small general aviation airport had a very brief existence. as it was not yet depicted at all on the October 1946 Charlotte Sectional Chart. 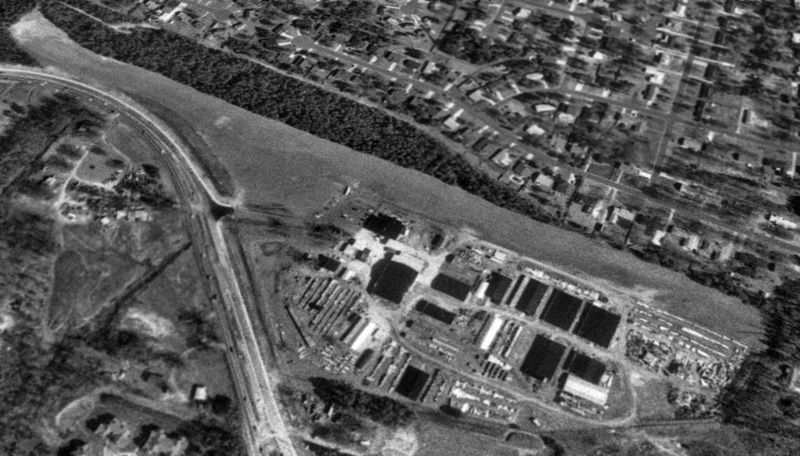 The earliest depiction which has been located of Carolina Skypark was a 5/15/48 USGS aerial view. and a single arch-roof hangar on the northwest side. was on the April 1948 Charlotte Sectional Chart. It depicted “Carolina” as a commercial/municipal airport. 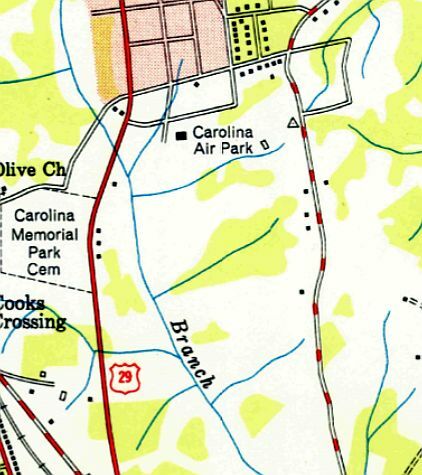 The 1950 USGS topo map depicted Carolina Air Park simply as an open area with 2 small buildings along the north side. was on the February 1950 Charlotte Sectional Chart. It depicted “Carolina” as having a 1,900' unpaved runway. as it was no longer depicted on the April 1952 Charlotte Sectional Chart. No airfield-related features were depicted at the site on the 1974, 1984, or 1991 USGS topo maps. and no obvious trace of any former runways was still recognizable. Note the large hole in the roof. A 2006 photo by Jonathan Cox of “the grassy area in front of the hangar looking toward Skyway Drive. 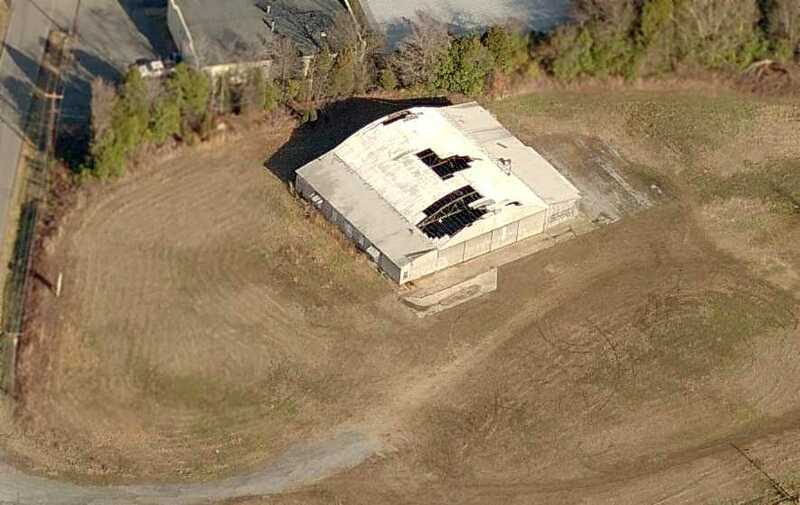 A circa 2006 aerial view looking north at the former Carolina Air Park hangar, showing the large holes in its roof. but the surrounding area had been built upon & no obvious trace of any former runways was still recognizable. 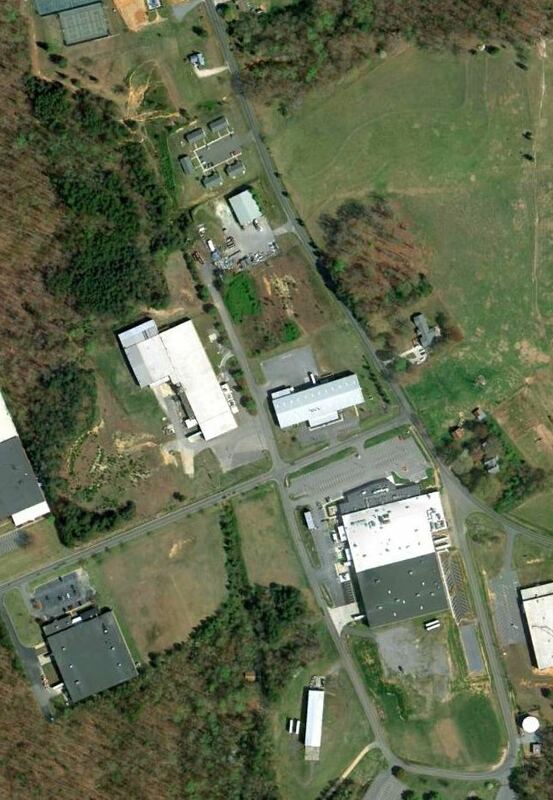 The site of Carolina Air Park is located northeast of the intersection of Pennsylvania Avenue & Skyway Drive. Note that the next street to the south is named Airline Drive. Thanks to Jonathan Cox for pointing out this airfield. 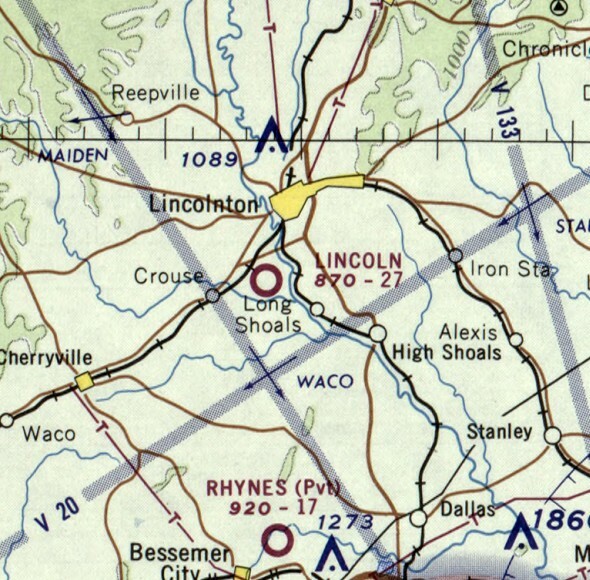 Lincoln Airport, as depicted in the April 1965 Charlotte Sectional Chart. as it was not yet depicted at all on the May 1963 Charlotte Sectional Chart (according to Chris Kennedy). was in the 1965 Jeppesen Airway Manual (according to Chris Kennedy). It listed Lincoln Airport, but did not provide any depiction of the field. It depicted Lincoln Airport as having a 2,700' unpaved runway. 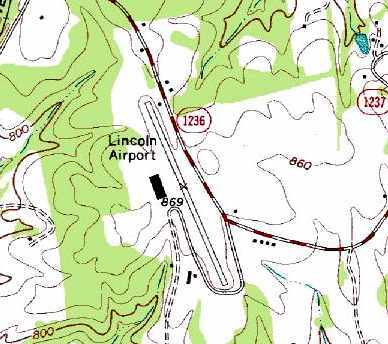 depicted Lincoln Airport as having a single 2,700' unpaved Runway 16/34. described Lincoln Airport as having a 2,700' dirt runway. nor depicted on the August 1988 Charlotte Sectional Chart (courtesy of Ron Plante). 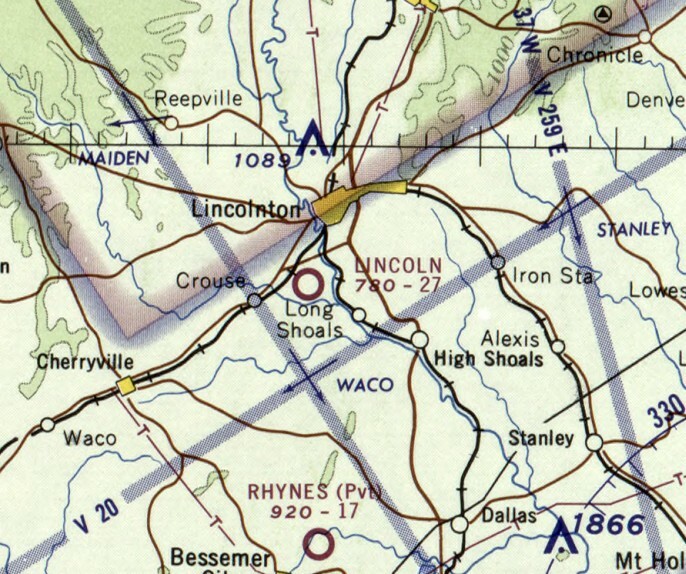 The 1996 USGS topo map still depicted Lincoln Airport, even though it may already have been closed for several years at that point. along with a single building (a hangar?) along the west side of the field. The 1998 USGS aerial photo showed several large buildings had been built over the Lincoln Airport property. but a careful examination reveals the remnants of the northwestern end of the runway & taxiway. The site of the Lincoln Airport is located at the intersection of Indian Creek Road Kawai Road. Thanks to Brett Kepner for pointing out this airfield. 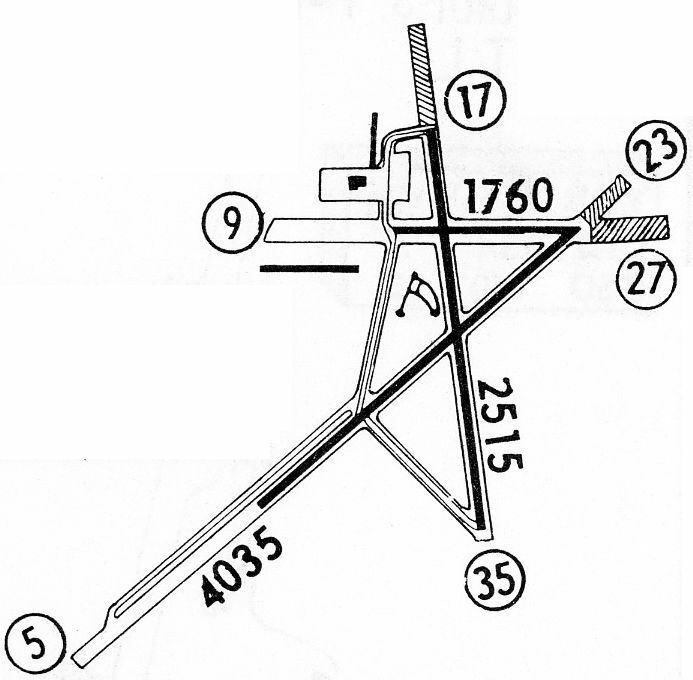 Carpenter Airfield, as depicted on the January 1957 Charlotte Sectional Chart. upon his retirement from the US Air Force after WWII. The airport was constructed on what was once the family cotton farm & many enjoyed learning to fly at Carpenter. Lee Smith & Jack Thompson operated the airfield for my great uncle under the name of Smith Regal Aviation. 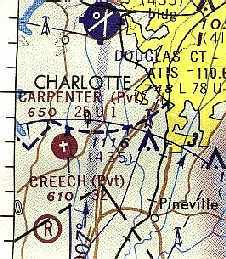 Carpenter Airport was not yet depicted on the January 1955 Charlotte Sectional Chart. was on the January 1957 Charlotte Sectional Chart. It depicted Carpenter as having a 2,800' unpaved runway. and was able to take a few lessons in one of their Champs. When I could afford them. I remember 2 crossed runways. I don't remember either as paved. and a 2,500' unpaved Runway 9/27. A taxiway led to a ramp on the north side of the field, with several small buildings (hangars?) around it. due to the construction of the Westinghouse Turbine Plant & the construction of Westinghouse Boulevard to connect it to NC Highway 49. 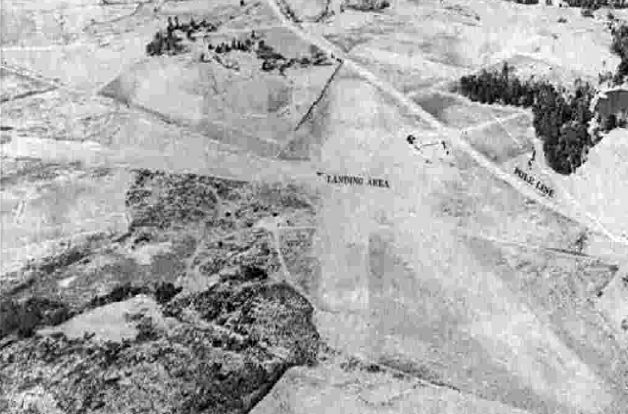 The earliest photo which has been located of Carpenter Airport was a 1960 aerial view. It depicted the field as having 3 runways, with 10 aircraft & 3 hangars on the west side of the field. One hangar was 630' feet long, and was prominently painted with “Carpenter Airport Charlotte” along the length of its roof. as having a 3,300' asphalt Runway 18/36, a 4,700' turf Runway 4/22, and a 2,500' turf Runway 9/27. The field was said to offer fuel, repairs, hangars, tiedowns, and charter. The operator was listed as Smith Regal Aviation (also a Champion & Mooney dealer). Stephen Hill recalled, “My father (Odell Hill) was a Certified Flight Instructor who flew students out of Carpenter Airport back in the 1960s as a PT labor of love. one of if not the very first BMW Izetta franchises, MotoGuzzi motorcycles. Jack Thompson (wore Stetsons & boots) and Johnny Crowell (drove a black Ford Thunderbird with hardtop & porthole windows). then Mr. Crowell would show us the proper way to pour some of your peanuts into the Coke bottle, then drink & eat them out. Crazy, but the best memories ever! Stephen continued, “I can also remember different young men who were building hours at Carpenter in order to go to work for the majors like Piedmont or Eastern Airlines. I could share some kindnesses showed to myself & my younger brother by barnstorming legend Johnny Crowell, who I can vividly remember. He was a great old boy. Another flier was an athletic blond named Bob Mobley. He asked me once if I wanted to go flying with him, and he did say he would be doing some spins & loops, but thinking I was 'all that' & a 12 year old bag a chips, I took him up on it. He took us up in what I remember to be a Citabria, tandem seater, and started doing aerobatics of all types. and my stomach & tonsils were shaking hands on a pretty frequent basis. I soon notified said pilot I was sick as a dog, who being a sympathetic & merciful guy, handed me a paper sick-bag & told me to sit back and enjoy it? He then continued wringing that airplane out for all it was worth. I never felt so glad to be back on terra firma, and I literally laid prone on the ground until the worst nausea passed. Ed Wright recalled, “Carpenters Airfield was one thing that had lasting (positive) impact on my teenage years. I had my first paying job there, took flying lessons there & was a member of an Air Explorer group based out of there. I lived at the west end of Ed Brown Road on Shopton Road West. So I grew up knowing about the airfield which was less than 2 miles from my house. I started hanging out there in 1964; visits started dropping off in 1967, my senior year of high school. My cousin John Knox worked there for years on a regular basis. What Lee Smith & Jack Thompson offered the teens involved with the Air Explorer group was fantastic. Charlie recalled, “Carpenter Airport... 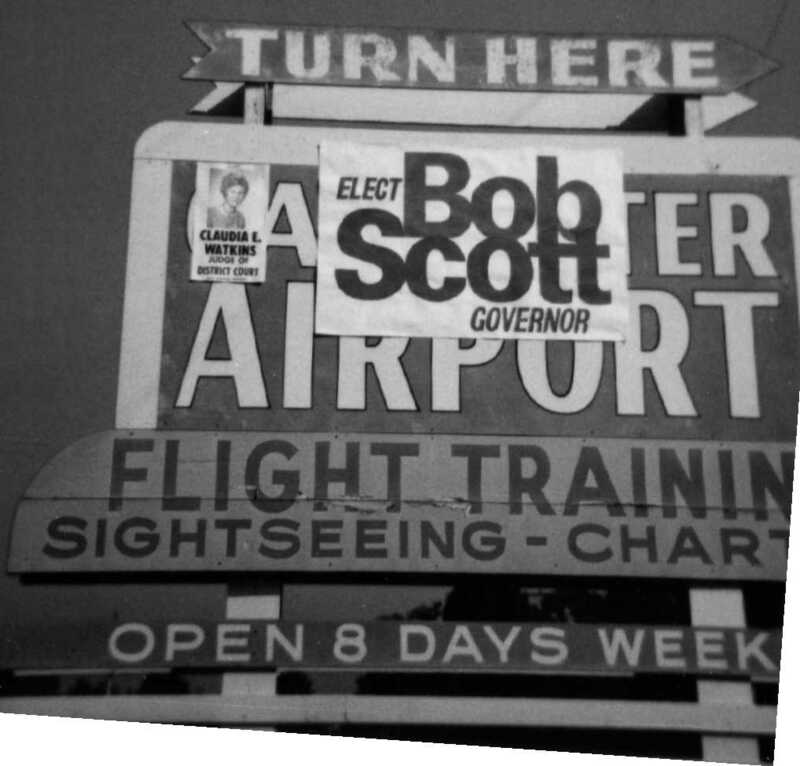 I learned to fly at this airport in 1965. At that time it was owned or run by a Col. Carpenter. 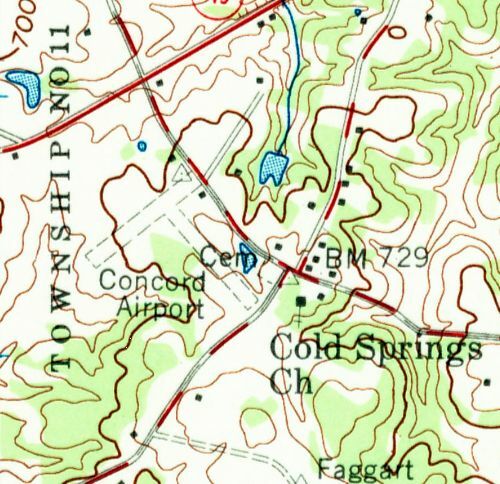 Carpenter Airport was not yet depicted at all on the 1965 USGS topo map. 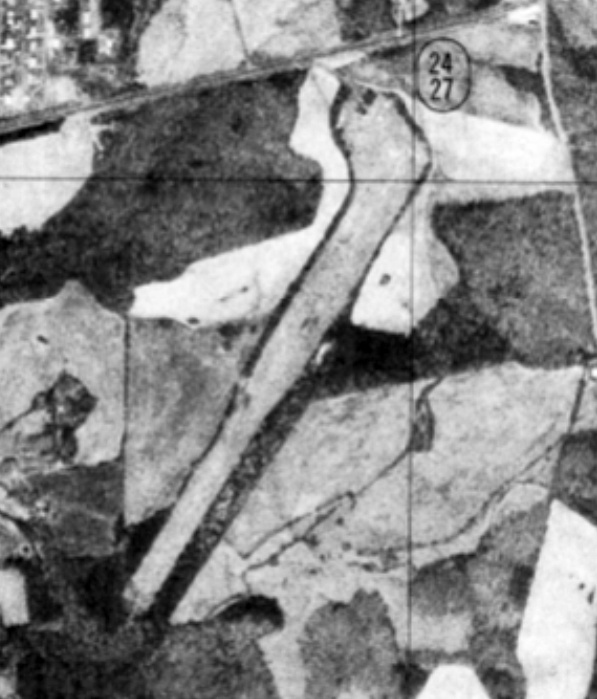 The earliest photo which is available of Carpenter Airport was a 2/22/65 USGS aerial view. It depicted the field as having 3 runways, with 5 aircraft & 3 hangars on the west side of the field. An undated aerial view looking south at Carpenter Airport from a 7/29/67 newspaper article (courtesy of David Jenkins). It said that Owe Carpenter offered to sell his airport to the city for $750,000. A 1968 aerial photo depicted the field in an unchanged manner. depicted Carpenter Field as having 3 unpaved runways each of which had a shorter paved portion. The 1968 USGS topo map depicted Carpenter Airport as having a 3 runways, and 3 hangars on the west side. A circa 1968 photo of the entrance sign for Carpenter Airport (courtesy of David Jenkins). 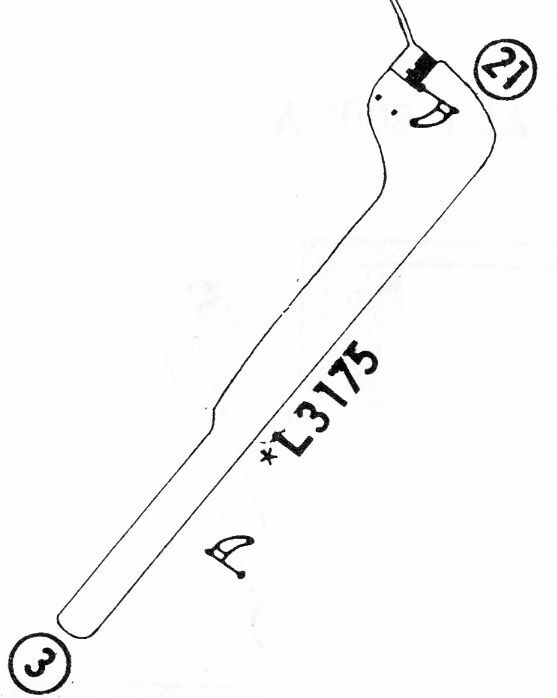 as that is how "Carpenter" was depicted on the August 1972 Charlotte Sectional Chart (courtesy of Robert Brown). It was depicted as having 2 paved runways, with the longest being 3,200'. Bill Francis recalled, “Carpenters succumbed to development sometime in the early 1970s. and looking down what would have been Runway 4 with regret. 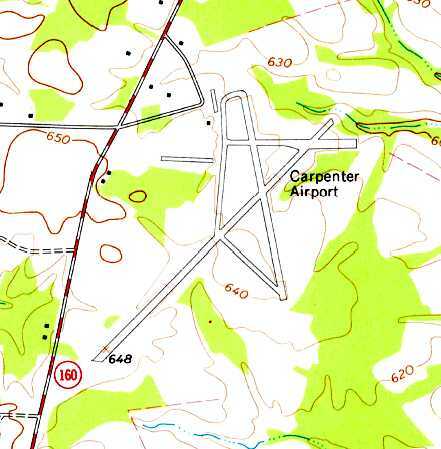 It was still depicted as "Carpenter" Airfield on the 1974 USGS topo map. 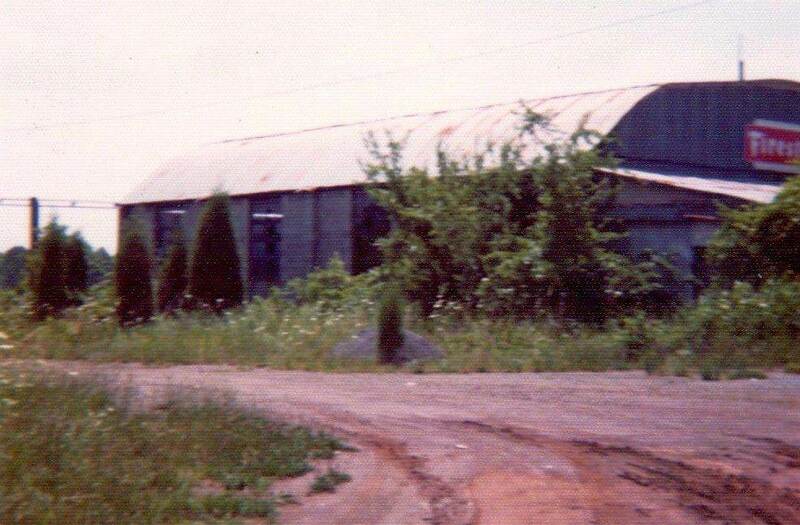 A circa 1974 photo of Carpenter Airport's maintenance hangar (courtesy of David Jenkins). but a commercial building had been built over the south end of Runway 35. 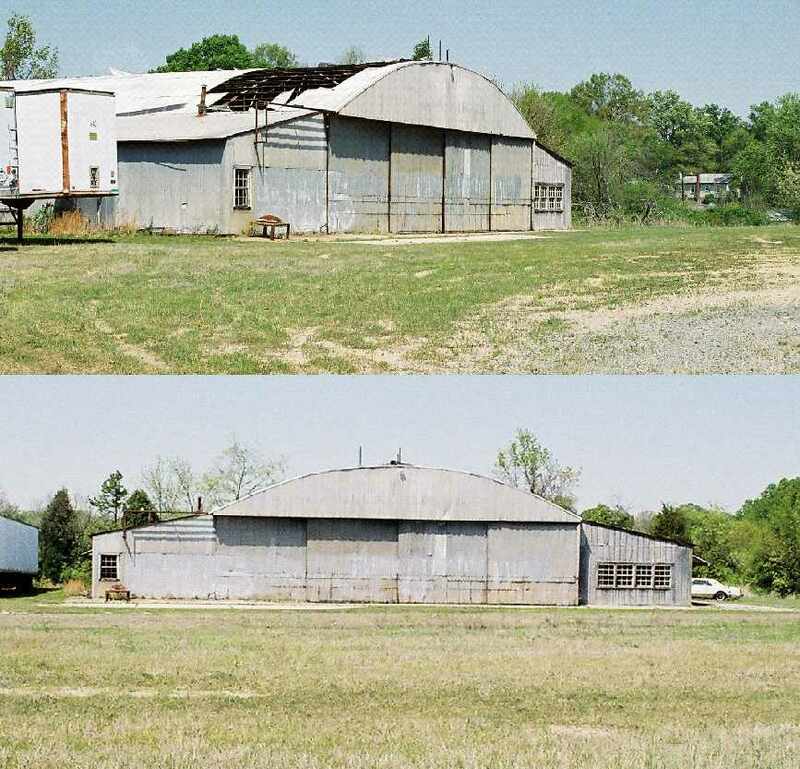 The hangars still remained standing, including the 630' long hangar painted with “Carpenter Airport Charlotte” along the length of its roof. According to David Jenkins, “As industry & highway construction divided the property, the airport essentially ceased operation. and drove out to a fence where you could see the runways & some old hangars. It was all very grown up with brush. I think there was an old single-engine plane there too." and buildings having covered any remaining trace of the former airport. 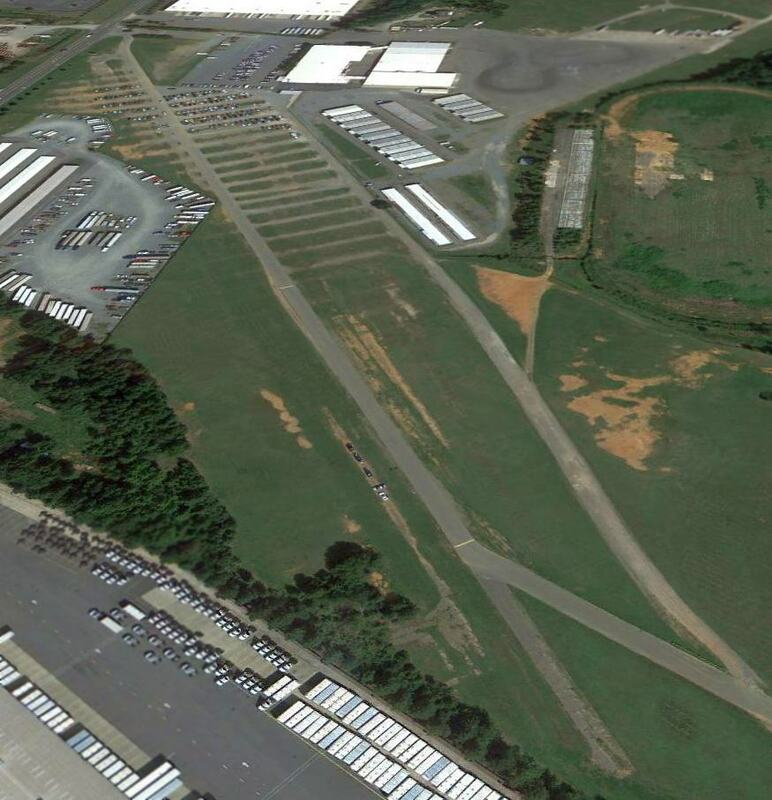 A 8/24/12 aerial photo showed not a trace appears to remain of the former Carpenter Airport. 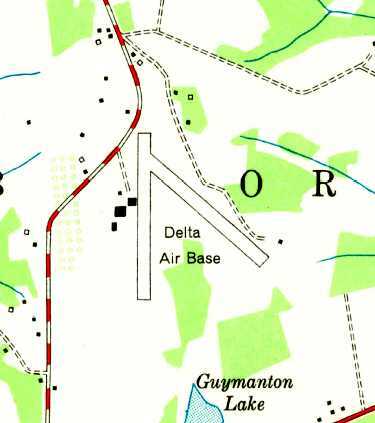 According to David Jenkins, “A wooden directional road sign which reads 'Carpenter Airport' is the only tangible remainder/memory of the airfield. is located northeast of the intersection of Westinghouse Boulevard & Steele Creek Road. Thanks to Gregory Jordan for pointing out this airfield. A 12/13/42 aerial view looking east at Delta Air Base from the 1945 AAF Airfield Directory (courtesy of Scott Murdock). as it was not yet depicted on the February 1942 Charlotte Sectional Chart. was a 12/13/42 aerial view looking east from the 1945 AAF Airfield Directory (courtesy of Scott Murdock). It depicted Delta Air Base as having 2 unpaved runways & a hangar on the southwest side. as a 164 acre irregularly-shaped property within which were 2 sod runways, measuring 3,100' north/south & 1,800' northwest/southeast. on the October 1948 Charlotte Sectional Chart (courtesy of Chris Kennedy). 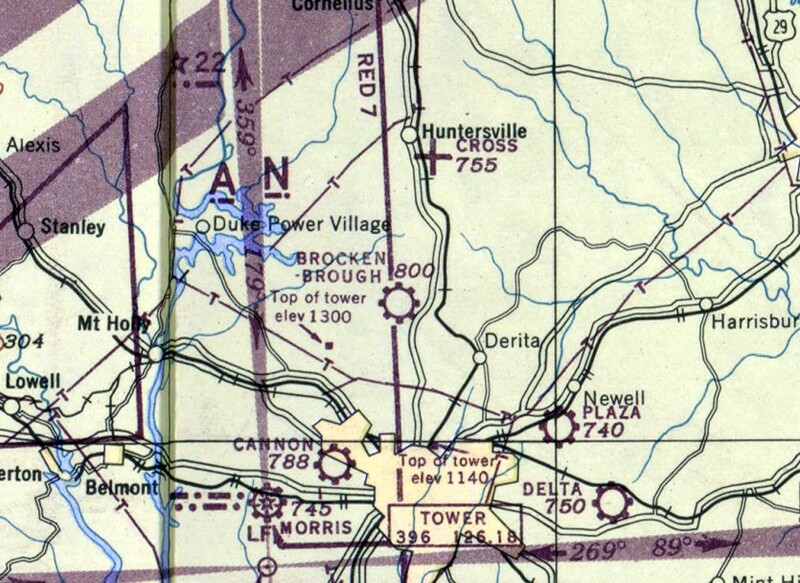 The 1949 USGS topo map depicted Delta Air Base as having 2 runways, with 4 buildings along the west side. along with traces of the former northwest/southeast runway, and possibly a 3rd runway oriented east/west. Two aircraft were visible along the west side of the field, including one fairly-large twin-engine aircraft. with a single 3,100' turf Runway 18/36. parked tightly together in a separate clearing adjacent to the south side of the field. A 1965 aerial photo showed 4 aircraft along the west side, including what appeared to be 2 DC-3s/C-47s. At some point between 1960-65, a field to the southwest had become an aircraft storage lot, holding a total of over 20 large twin-engine aircraft. In the 1960s, Delta Air Base was the home of a bustling aircraft salvage operation. "In 1965, a bunch of us had gone to Charlotte for a convention, sponsored by Hickory Grove Baptist Church. As we wound down Albemarle & turned off on Hickory grove, we spied the tail end of a large dirt strip. In the background were DC-6s, a Connie, and all matter of wrecked planes. As soon as we got to the church, 3 of us bolted, fled down the road to the base. It was called "Charlotte" or "Carolina Airplane Salvage", and was not open to the general public. but let us look at some piles of B-17 & B-24 ball turrets stacked up 20-30' tall, B-17 & B-26 noses. even a couple of USMC jet Corsairs." Spurgeon continued, “Being the good obedient Baptists we were, we left, ran down the road, & jumped the fence. and that Connie, that was every color of the rainbow, but intact & due to fly out within the next week or 2.
we soberly realized that we were looking at remains of planes that had experienced & wrought death." A 1968 aerial photo showed that houses had covered the eastern portion of Delta's former crosswind runway at some point between 1965-68. One fairly-large twin-engine aircraft was visible on the west side of the field. The number of aircraft visible in the storage lot to the southwest had decreased somewhat to 17, since the 1965 photo. Chris Davis recalled, “When I found Delta Air Base on 10/18/70 I was amazed at the number of aircraft that were parked there. Rick Caston recalled, “There never were 2 'B-26s' at the company. There was an A-26 that sat out in the very back of the bone yard which was indeed flown out somewhere around 1971.
and I played in many of these airplanes on Saturdays when I went to work with him. The A-26 was sold to an air race pilot named Jack Sliker who traded a Piper Super Cub for it. My Dad kept me out of school the day THE A-26 was supposed to fly out but they ran into a few problems & put it off for a few days. Not knowing exactly when Jack would take it out I wasn't able to see the actual departure. I used to fly the Super Cub after I soloed in 1972. I also worked for CAC while in high school & during my summer vacations from college. Jenks Caldwell Sr. helped me get my pilot job at Piedmont in 1985. During the 1960s when I was there a lot I know that I played in THE A-26 with my brothers. We also spent time in the American Airlines DC-6Bs, the United DC-7s, Piedmont's DC-3s, and Martin 404s. There was never any machine guns in these airplanes & certainly not the ONE A-26. I too worked in 'Inventory' part time each day after high school until I graduated in 1974. After that I worked again in 'Inventory' during my summer breaks from The Citadel. We worked in the warehouses with parts as well at the smelter. Delta's runway had been lengthened to 4,200'. which made a huge impression on an airplane-minded kid like me. on the 'front' side of the facility. leading the Charlotte Aircraft folks to remove the rest & store them more securely. The first photograph I ever took in my life was in the cockpit of one of these B-26s. and their place was taken by a pair of Martin 404s marked 'Cruzeiro do Sul'. The rumor was that the B-26s were headed for some clandestine operator & I never heard any more about them." 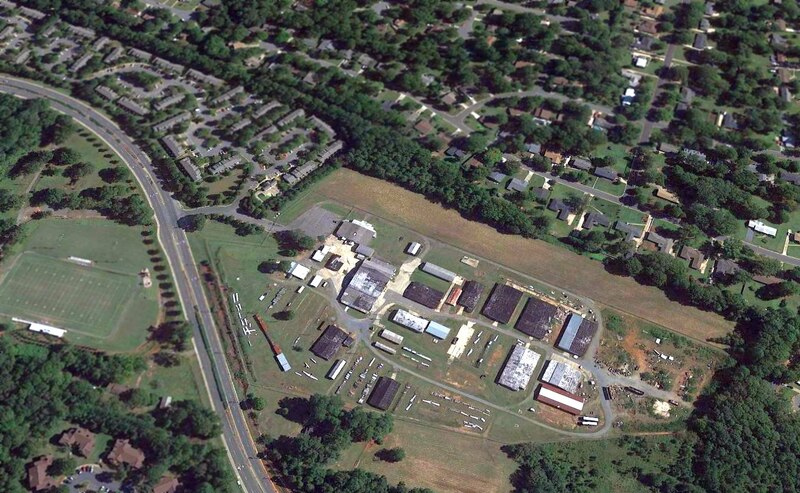 "There were actually two businesses sharing Delta Air Base in 1973, Charlotte Aircraft and 'Equipment & Supply'. while Equipment & Supply concentrated on the salvage part of things. I worked for Equipment & Supply, my brother worked for Charlotte Aircraft. Equipment & Supply would buy job lots of surplus government stuff, clean up the parts & resell them. recording any numbers that I could find, and filing the info in a card file so it could be matched against customer parts requests. There were many aircraft in the back as shown in the photo from 1963 [above], DC-3s & things like that. What doesn't show is the small stuff. In the dead center of that photo, just before the RH line of old hulks, there was a jet fighter fuselage. I thought it was an F-80 but inside the gun doors it said P-80, meaning it predated the 'F' numbering convention. Next to it was an F-84 fuselage, with the wings removed & lying nearby. Both of these aircraft had been stripped of anything useful & were waiting to be melted down. appearing intact (wings removed & packed on edge on each side of the fuselages). and he said $100 for either the P-80 or F-84 but he'd have to have $200 each for the Sabres! Well, I was making $1.35 an hour & trying to save money for college, so that wasn't possible - too bad!" "There were racks of canopies going milky in the sun & piles of drop tanks in the 'front' part of the yard. Then came the buildings that are apparently still there. with the top box unpacked & its contents left out to show what was in all the others. There were engine storage containers too, with R2800s & other engines in a state of semi-preservation. Inside the Charlotte Aircraft buildings there was a room full of all kinds of aircraft maintenance manuals. In our Equipment & Supply area there were the original wood molds for making B-26 clear plexiglass noses. There was a cockpit mockup of the XB-43. (and one complete, skinned BT-13 fuselage in the boneyard). It was just a fabulous place for an aircraft buff." 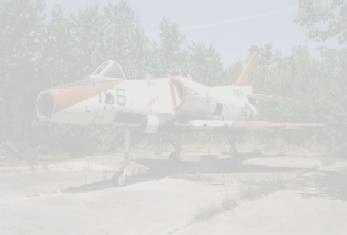 "Many years after working there, I called to see if any of the aircraft or parts were left. I was told that they had all been melted down years ago, and [the later aerial photos] seem to confirm this. because of pollution & the encroachment of residential housing. and the number of mostly-intact aircraft recognizable in the storage lot to the southwest had dwindled to only 4.
described Delta as having a single 4,200' Runway 18/36. A 1985 aerial photo by Paul Cotrufo looking northeast at Delta Air Base. The large number of transport aircraft previously visible in the 1963 aerial photo had been removed by this point. A 1985 aerial photo by Paul Cotrufo of the aircraft salvage yard at Delta Air Base. The August 1990 Charlotte Sectional Chart (courtesy of Ron Plante) depicted Delta as a private airfield with a 3,000' unpaved runway. along with a large quantity of aircraft parts stored around the buildings. On the 1996 USGS topo map, the runway's length had shrunken back to 3,000'. A 1998 aerial photo showed that housing construction had started at some point between 1993-98 on the northern portion of the Delta Air Base runway. 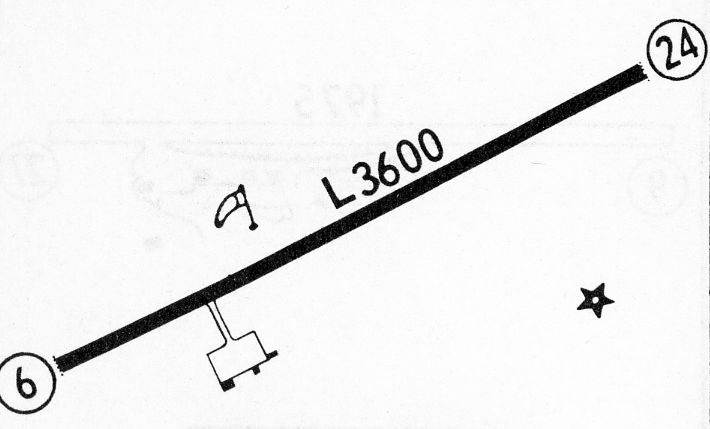 The 1999 Charlotte Sectional Chart depicted Delta as a private airfield with a 3,000' unpaved runway. As of 2002 Delta Air Base was listed as a heliport, and the published length of the runway had shrunken again, to only 1,000'. As of 2002, the owner of Delta Air Base is listed as Charlotte Aircraft Corporation, which apparently is still involved with aircraft salvage. which is a much bigger airport & isn't hemmed in by development like Delta Air Base. 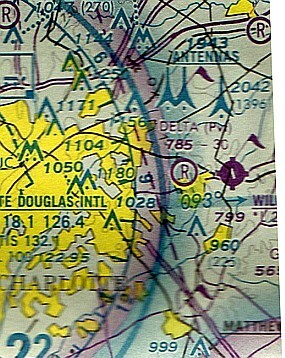 The 2005 Charlotte Sectionl Chart no longer depicted Delta as an airfield or heliport. A circa 2006 aerial view looking west at the hangars, warehouses, and aircraft parts on the west side of Delta Air Base. A 2016 aerial view looking northeast at the site of Delta Air Base showed that about half of the length of the north/south grass runway remained clear. Various aircraft parts were still located around the large number of warehouses to the west of the runway. 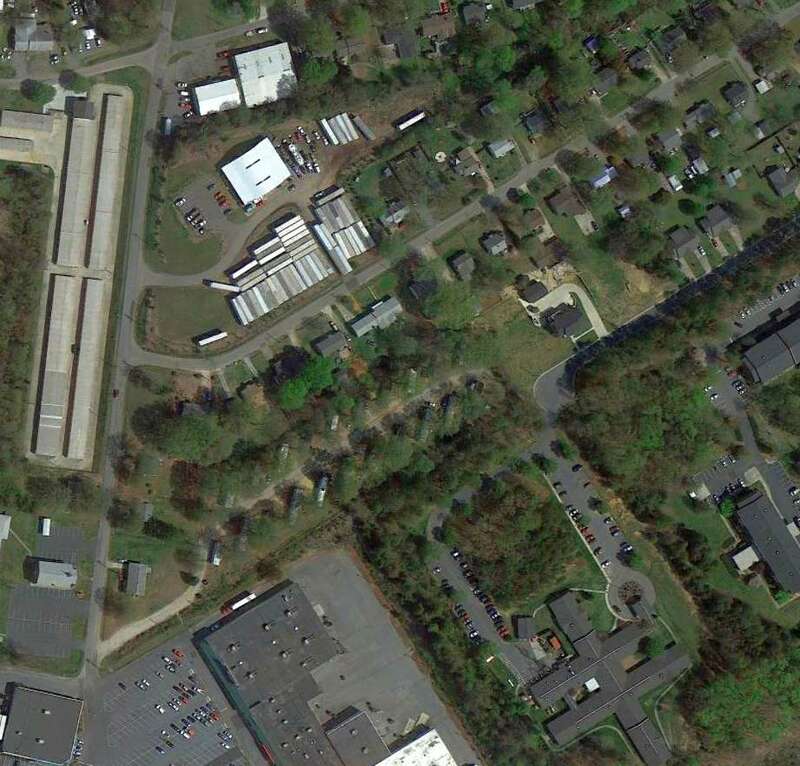 Delta Air Base is located northeast of the intersection of East Harris Boulevard & Albemarle Road. 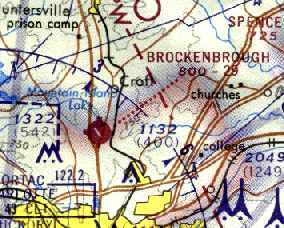 Brockenbrough Airport, as depicted on the April 1945 Charlotte Sectional Chart. Brockenbrough Airport was located on the grounds of the Metrolina Fairgrounds, adjacent to the southwest side of the racetrack. as it was not yet depicted at all on the November 1944 Charlotte Sectional Chart (according to Chris Kennedy). which depicted it as a commercial airport. as a 131 acre irregularly-shaped property within which were 2 turf runways, measuring 2,150 NNW/SSE & 1,900' northeast/southwest. 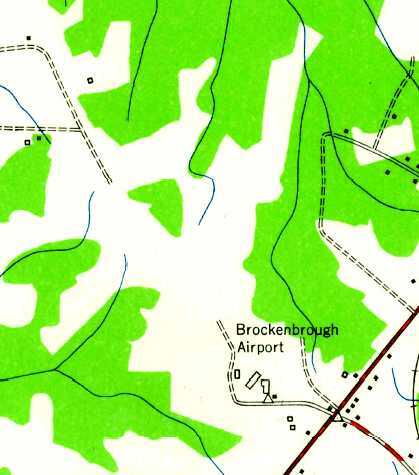 The 1948 USGS topo map labeled Brockenbrough Airport, and depicted several small buildings, but did not depict any runways. Kevin Estes recalled that he & his father “went flying out of that airfield once or twice. 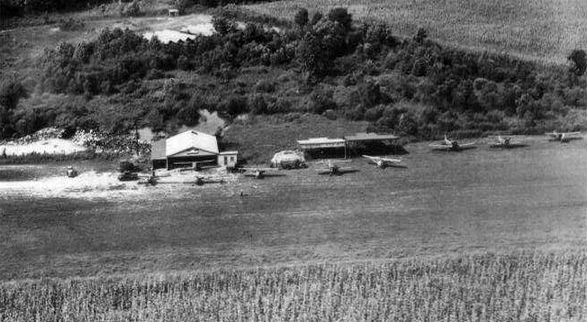 The earliest photo which has been located of Brockenbrough Airport was a 1960 aerial view. with a cluster of 6 individual T-hangars & 2 other small hangars, and one single-engine aircraft at the south side. 2,700' Runway 15/33 & 1,800' Runway 4/22. The operator was listed as E.H. Brockenbrough. 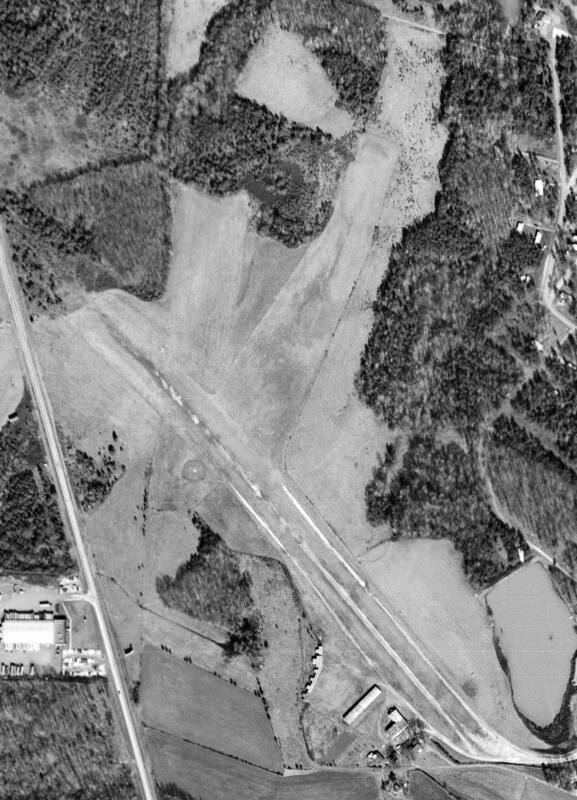 The only photo which is available showing Brockenbrough Airport while open was a 2/2/65 USGS aerial view. It depicted Brockenbrough in basically the same fashion as the 1960 photo, but there were no aircraft visible on the field. James McDonald recalled, "I was a frequent flyer at Brockenbrough (pronounced brock-in-burr-oh) between 1965-67. Mr. Brockenbrough had retired & the facility was operated by Henry (Hank) Dutch. and piloted C-124 Globemasters for the Air Guard or Reserves. and a big mutt named Bozo lived on-site. by running, then jumping & sliding through an inch of water on the floor of an abandoned hangar. and a lone Apache for some economical twin time (I think dual in the Apache went for $35/hr). By the way, I had a forced landing in one of the 140s courtesy of a complete engine failure." 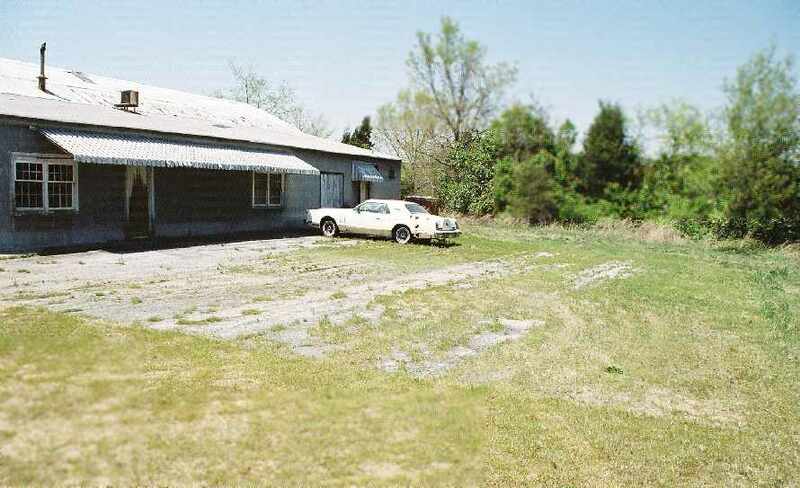 James continued, "This place was a Mecca for the Charlotte Civil Air Patrol seniors & cadets. The CAP stable contained an L-16, a J-3 Cub, and a Supercub as well. but I have used it quite successfully when the crosswind component reached 35 knots on 14/32." with several small buildings on the southwest & southeast sides. A 1968 aerial photo showed that a racetrack & several buildings had been built at some point between 1965-68 over the northeast/southwest runway. The northwest/southeast runway & the hangars remained intact, but there were no aircraft visible on the field. 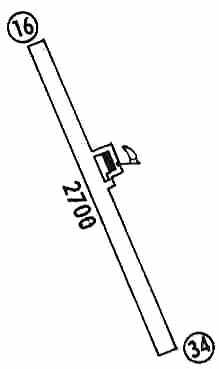 depicted the field as having a 2,900' paved runway, oriented northwest/southeast. A 1978 aerial photo showed that 5 single-engine aircraft were visible on the south side of the field. The cluster of 6 individual T-hangars had been removed at some point between 1968-78. Michael Payne recalled, “I learned to fly & soloed at Brockenborough in the late 1970s & early 1980s. I also worked for Jerry & Ted Archer there. They ran the Metrolina Flying Club. The full length runway & taxiway were both paved. I later worked in the airlines with one of the guys that lived in a trailer on the field when I was there. One of the last jobs I had there before I left was to tear the taxiway up & seed with grass. There were a lot of interesting characters there. I helped Kelly (A&P) in the shop, washed & cleaned the planes, fuel, and general FBO duties. The story around the field was that one of the old A&Ps there developed the STC for the 90hp Cub engine or exhaust manifold. as having a 2,391' asphalt Runway 14/32. The unpaved crosswind runway had apparently been closed at some point between 1965-82. According to Charles Phillips, Jerry Keller was the last operator at "Brock". He later moved to the Metrolina Flying Club at Willgrove (8A6) in Charlotte. Charles recalled, “Brockenbrough was closed when the owner Horace Wells died. His niece closed the airport in August 1986. I was running the maintenance shop at the time. I also worked at Eastern airlines. I was evicted on Tuesday & laid off at Eastern on Thursday of the same week. Just like the Space Shuttle blowing up and the Twin Towers falling you remember dates that will never forget. The airport was closed to make room for parking at the Metrolina flea market. I was told to haul the planes out that I was working on. even though it had been closed for 10 years by that point. 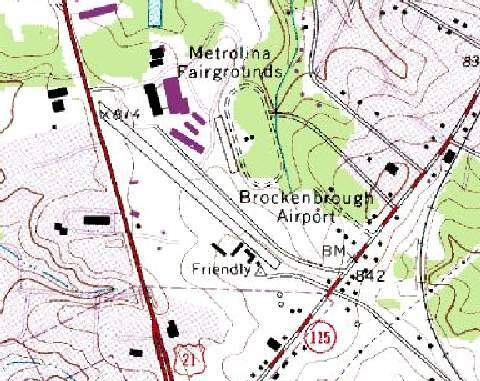 Brockenbrough Airport was no longer depicted at all (even as an abandoned airport) on the 1998 World Aeronautical Chart. and was being used as a road for adjacent automobile parking areas. 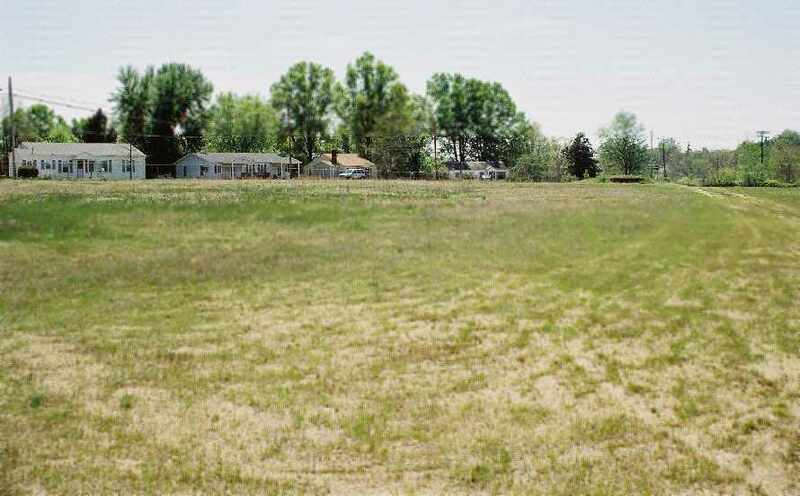 The site of Brockenbrough Airport is located west of the intersection of Old Statesville Road & Apache Avenue. 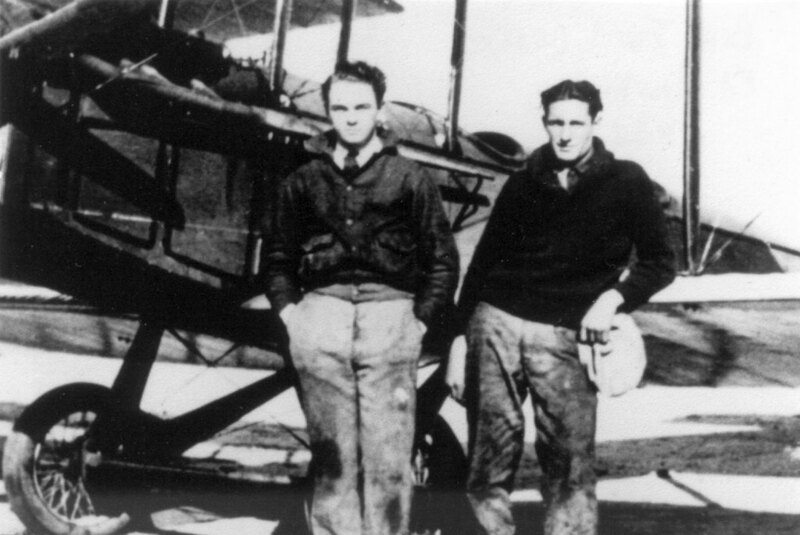 A 1932 photo by William S. Ford of William “Billy” Ford & Ed Newkirk standing in front of Ford’s Curtiss JN-4 Jenny at North Wilkesboro Airport (courtesy of Dave Ford). The date of construction of this municipal airport has not been determined. Dave Ford reported, “I have located the airfield where my father (William 'Billy' Ford) flew his first airplane in 1925 in North Wilkesboro. When he was a young boy he acquired a Jenny & refurbished it at the field in North Wilkesboro. He & his friend Ed Newkirk were considered local aviation pioneers & barnstormers. He was 18 years old when he took off in the Jenny at the North Wilkesboro field. was a 1932 photo of William “Billy” Ford & Ed Newkirk standing in front of Ford’s Curtiss JN-4 Jenny (courtesy of Dave Ford). 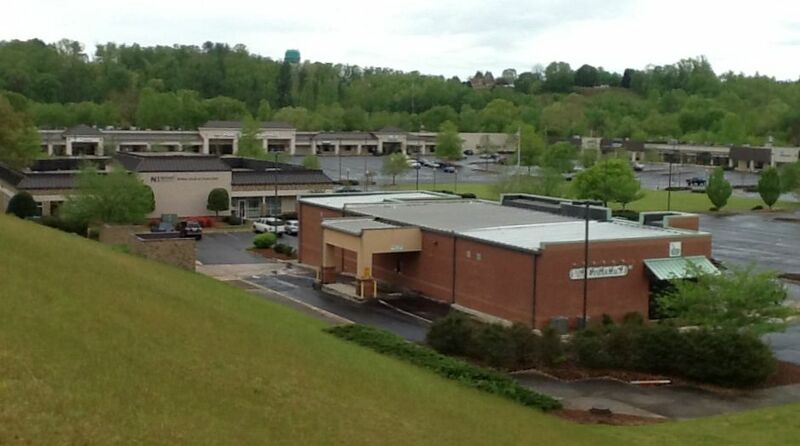 It described North Wilkesboro as a commercial airport, measuring 6 acres in size. The turf field was said to be oblong in shape, and to measure 1,200' x 300'. The field was said to have a hangar. was on the 1935 Winston-Salem Airway Chart. 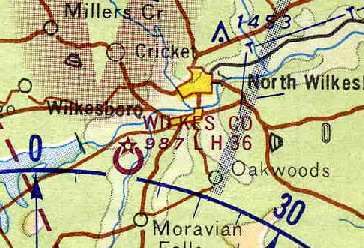 It depicted North Wilkesboro as a commercial or municipal airport. 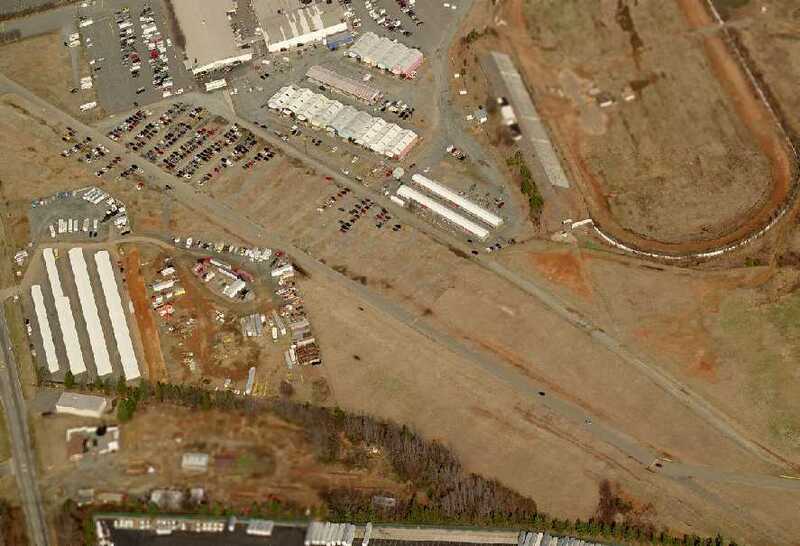 described North Wilkesboro Airport as having a 1,500' east/west turf runway & a hangar. in The Airport Directory Company's 1938 Airports Directory (according to Chris Kennedy). nor depicted on the 1945 Winston-Salem Sectional Chart (courtesy of Chris Kennedy). depicted "North Wilkesboro" Airport as having a 1,500' unpaved runway. which depicted 8 single-engine aircraft & some hangars alongside a grass runway. 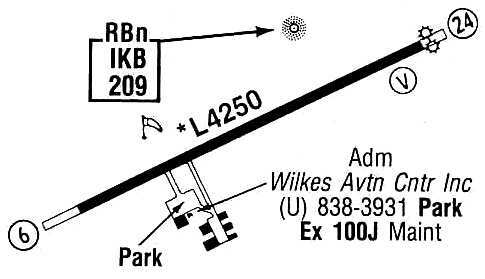 North Wilkesboro Airport, as depicted on the July 1961 Winston-Salem Sectional Chart (courtesy of Chris Kennedy). with a 2,300' turf runway, and the operator listed as Woodruff R. Wallace. 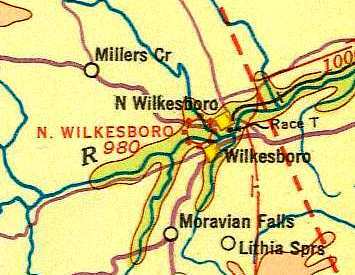 as the North Wilkesboro Airport was no longer listed in the 1963 AOPA Airport Directory (according to Chris Kennedy). but not the original North Wilkesboro Airport. 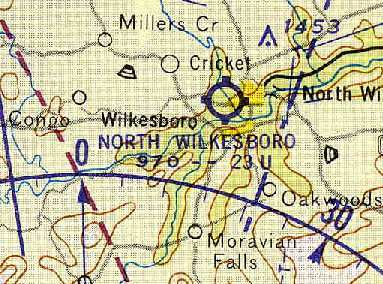 The 1966 USGS topo map did not depict the original North Wilkesboro Airport. Interestingly, though, it did still depict a survey marker named "Piper"
at the site of the original North Wilkesboro Airport. it is not known if this was an airfield building (a hangar?). of the site of the original North Wilkesboro Airport. It did not appear as if any original airfield buildings remained. 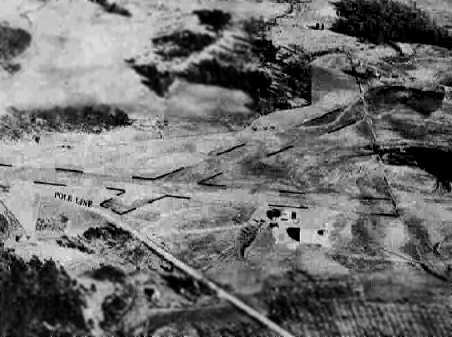 The eastern portion of the airfield remained an open field. with no recognizable traces of the former airport. A 2016 photo looking southeast at the site of the original North Wilkesboro Airport (courtesy of Dave Ford). 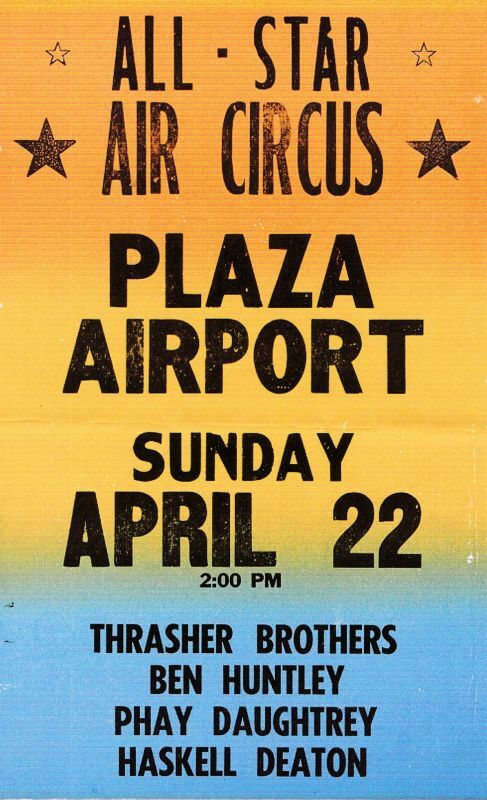 Dave's cousin Bill reported that “The area that was the airport was a long field which is now a medical professional plaza. 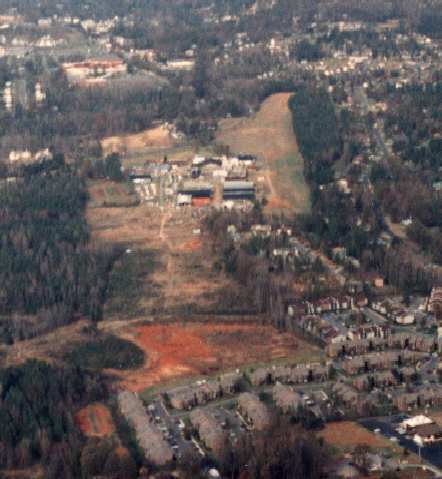 The site of the original North Wilkesboro Airport is located south of the intersection of Business Route 421 & West Park Lane. 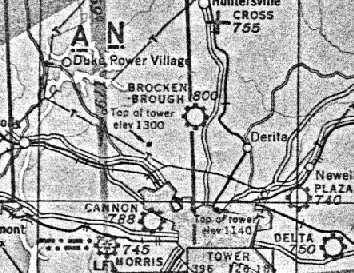 Wilkes County Airport, as depicted on the April 1964 Winston-Salem Sectional Chart (courtesy of Chris Kennedy). was evidently replaced by the new Wilkes County Airport. was on the April 1964 Winston-Salem Sectional Chart (courtesy of Chris Kennedy). It depicted the new Wilkes County Airport as having a 3,600' hard-surface runway. 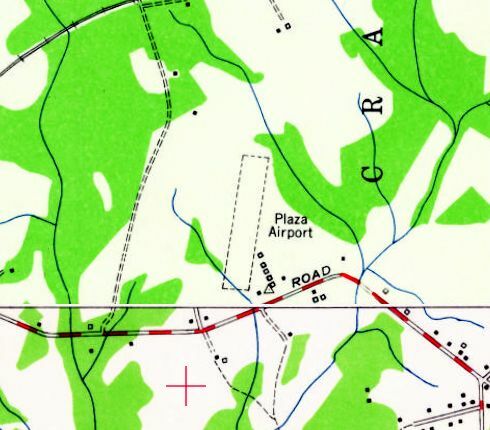 The 1966 USGS topo map depicted Wilkes County Airport as having a single northeast/southwest paved runway with a ramp & 2 buildings on the south side. and a ramp on the south side of the runway with 3 buildings (hangars?). The 1971 Flight Guide (according to Chris Kennedy) described the Wilkes County Airport as having a 3,600' paved Runway 6/24. as having a 4,250' paved Runway 6/24, and listed the operator as Wilkes Aviation Center Inc.
and a ramp on the south side of the runway with 6 buildings (hangars?). The operator was listed as Wilkes Aviation Center, Inc.
when it was replaced by a newer & larger Wilkes County Airport to the Northeast. 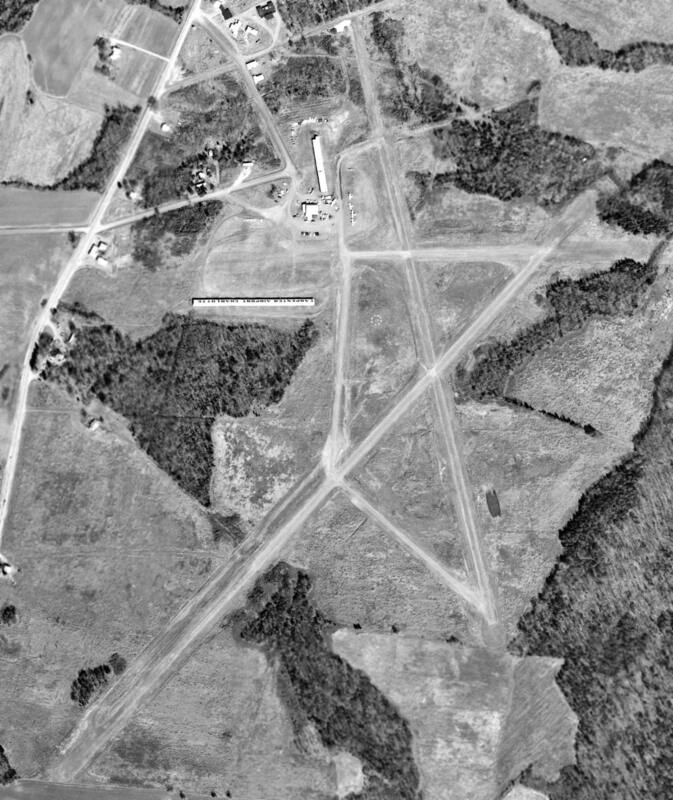 As of the 1993 USGS aerial view looking northeast (taken after the field's closure), the original Wilkes County Airport remained completely intact & unredeveloped. 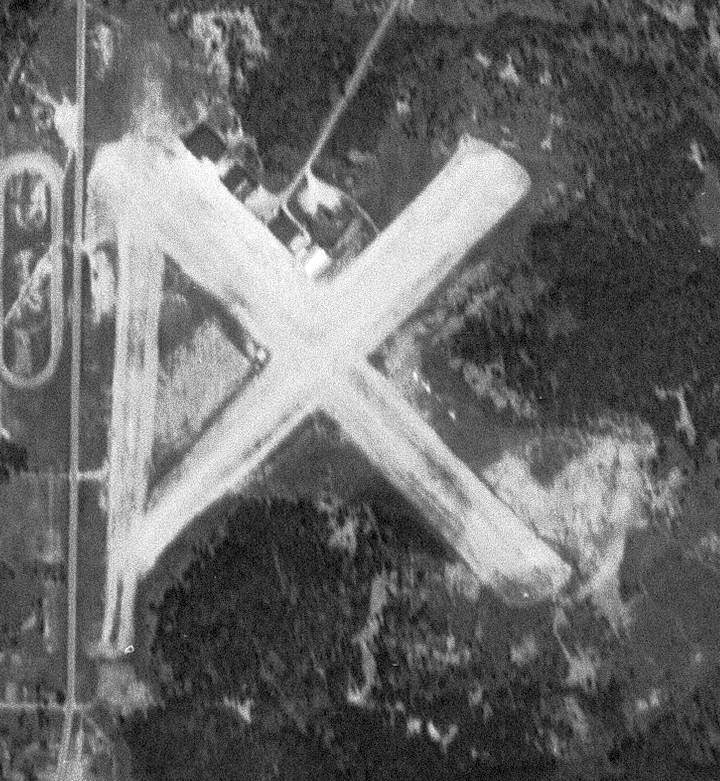 The paved runway was marked with 3 closed-runway “X” symbols, and all of the hangars remained standing. 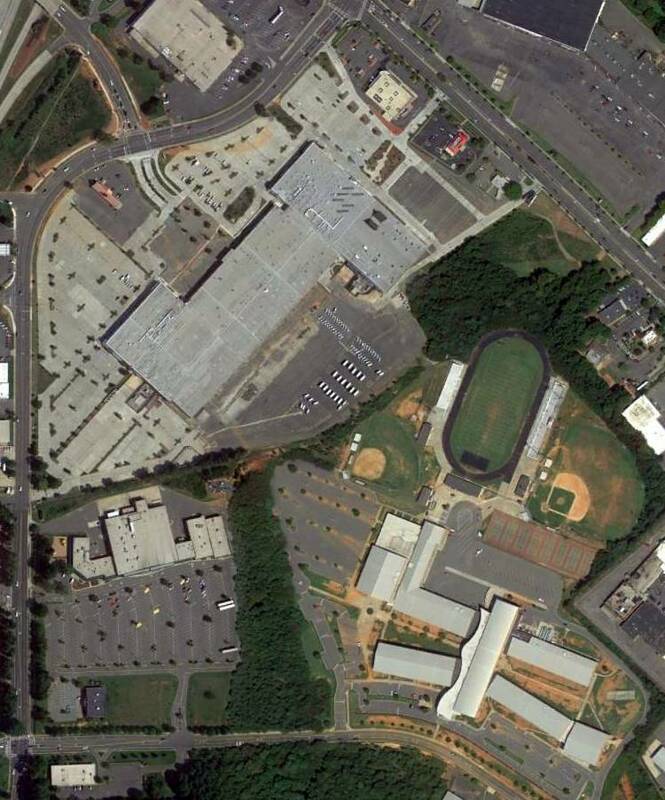 "a gigantic parking lot during MerleFest every April. MF is a 4-day bluegrass festival that gets bigger every year (last year was around 70,000 people I think). We parked right along an old runway with tons of other cars." which has radio-controlled flying, skateboard park, soccer fields, etc. 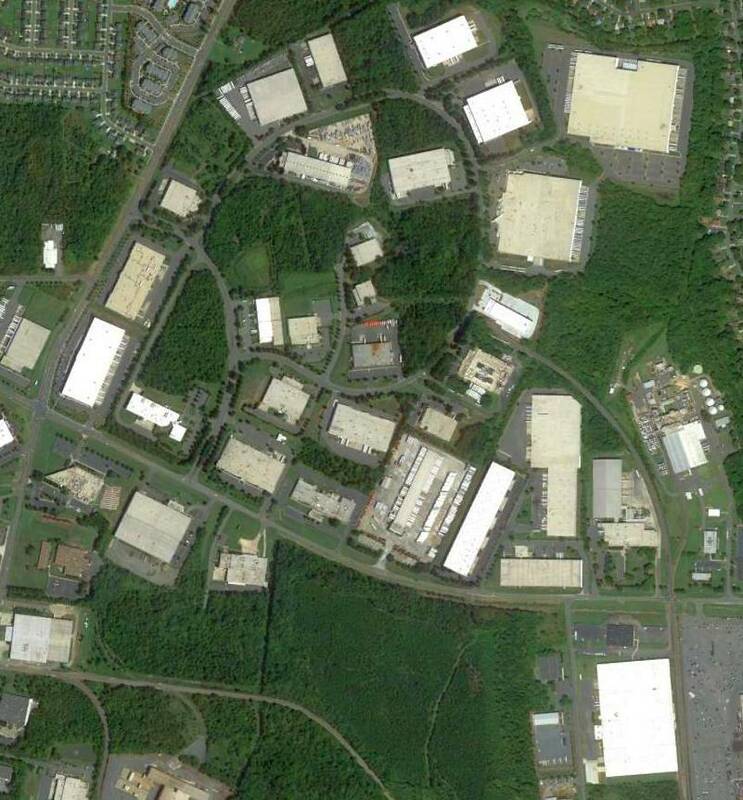 on one side, and on the other an industrial park. 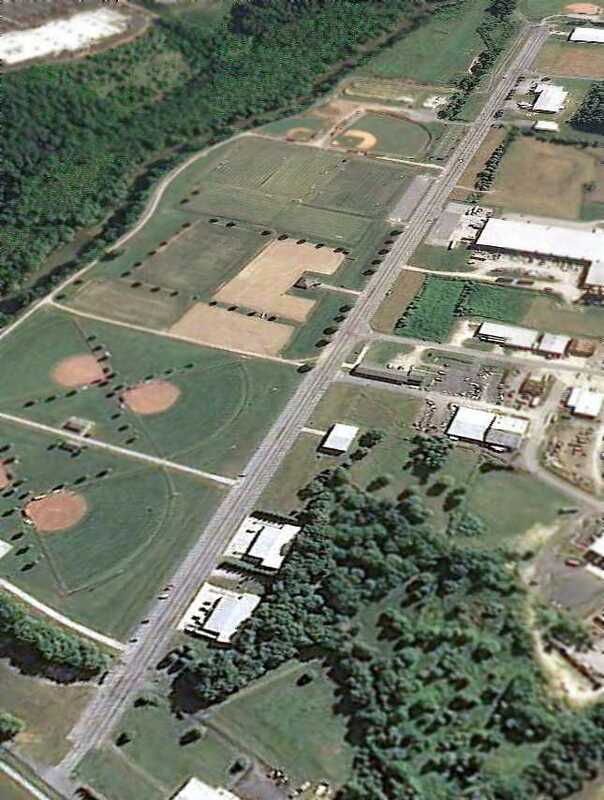 and the area to the north had been redeveloped as ballfields. The original Wilkes County Airport is located at the end of Stokes Street, northwest of Route 268.